The Best Western Garden Inn is ideally located in the center of Santa Rosa. Come and experience our hotel near the major tourist attractions. Best price guaranteed and exclusive deals. 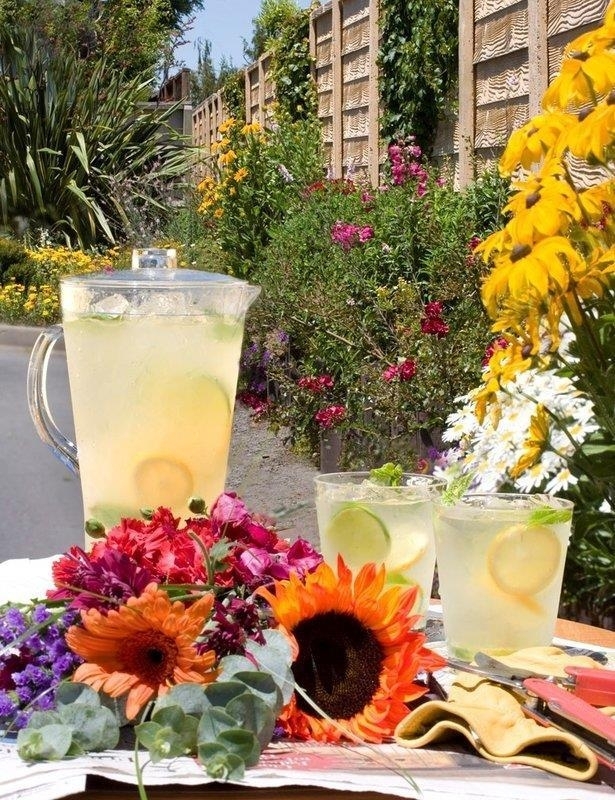 Tour the Sonoma Wine Country while staying at this beautiful, garden setting Santa Rosa hotel. 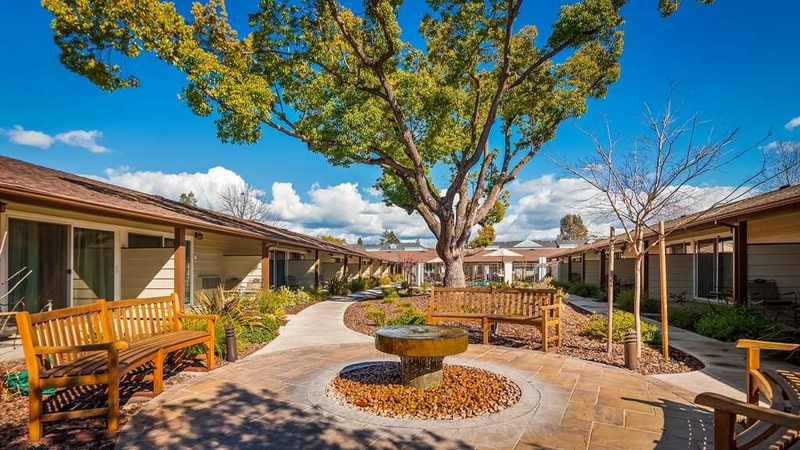 The Best Western Garden Inn, located in Santa Rosa, California features 79 guest rooms and a beautifully landscaped quiet garden. 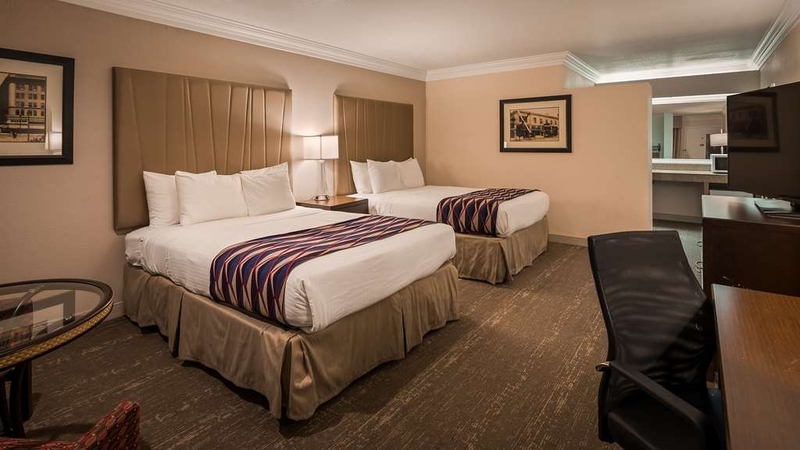 Hotel guests are only minutes from Sonoma Wine country and all of the area attractions which include the Sonoma County Fairgrounds, the Russian River Redwoods and downtown Santa Rosa. 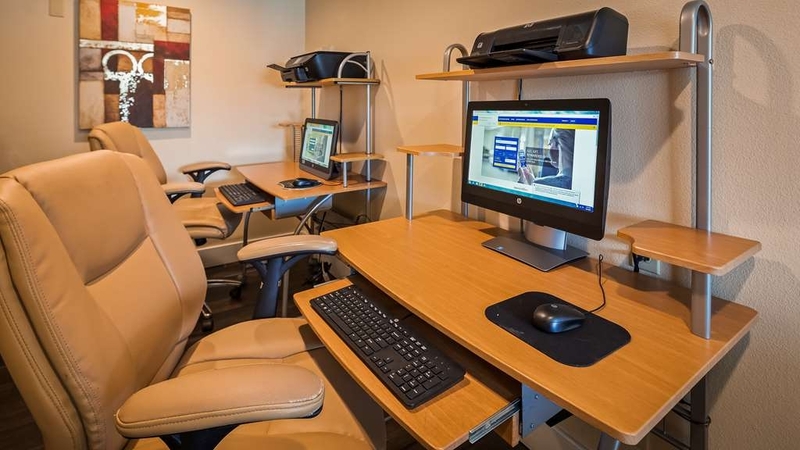 All spacious well-appointed guest rooms come equipped with a microwave, refrigerator and high-speed Internet access. Guests can start the day off with breakfast and finish the day with dinner at the Garden Cafe located on the hotel premises. 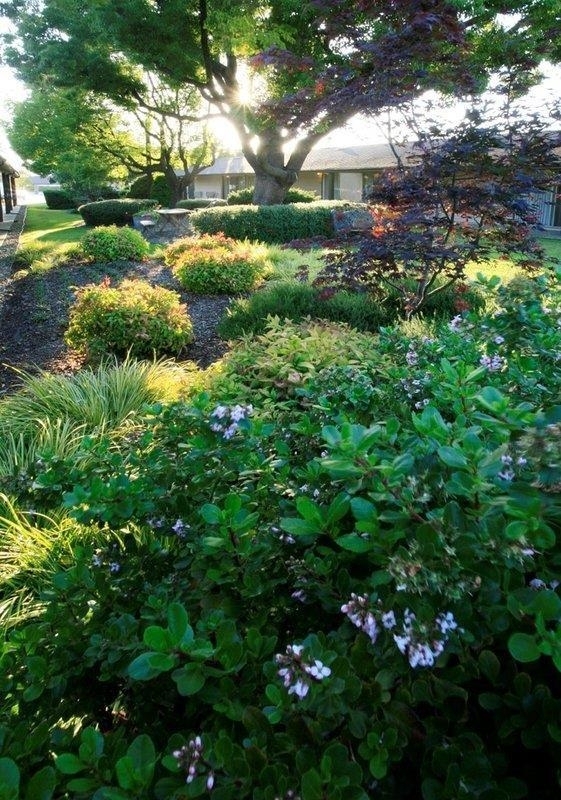 The Best Western Garden Inn also features two outdoor seasonal pools, dry cleaning services and free parking. Families will appreciate being only one mile from the Snoopy Museum. The Luther Burbank Gardens and the Jesse Peter Native American Art Museum are also close to the hotel. Make a reservation today and save at the Best Western Garden Inn. Enjoy your stay. "rainy night in Santa Rosa"
Parked right at my door! Cross ventilation! Pretty good coffee! Quiet off-street parking! Really nice garden and pool area quiet space, serene and comfortable, with sliding glass door access! Good internet and nice toiletries! "Clean, comfortable and reasonable rate"
The hotel was great. The room was very large. Very comfortable cute garden area. Enjoyable full breakfast in cafe setting. We stayed multiple nights, definitely would again and will recommend to others. "Best Western Garden Inn Santa Rosa CA"
Best Western is our place to stay when we are on the go. 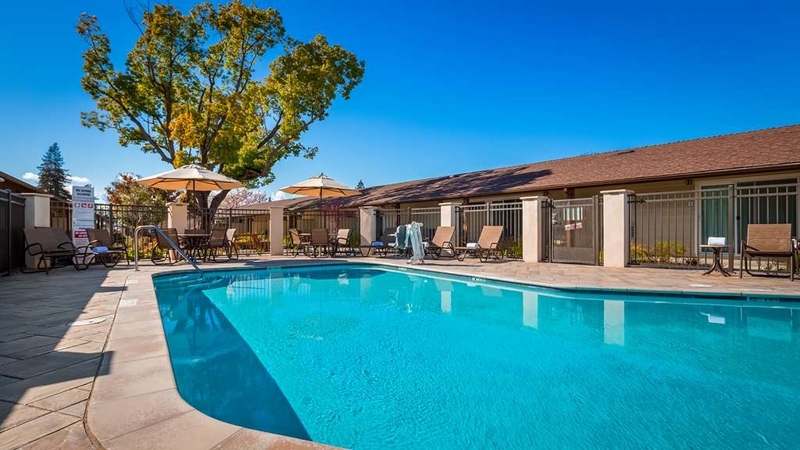 The Best Western Garden Inn of Santa Rosa, CA is very close to everything you would want to do in Santa Rosa, California. If you are heading up to Santa Rosa, California then Best Western Garden Inn Santa Rosa is the place to stay. Thank you for you great response, I t was a pleasure having you stay with us. We look forward to your next stay. "Our stay at the garden inn !!" Thank you Dan & Deborah, I am so pleased that you enjoyed your stay. We look forward to seeing you next time you are in the area. I appreciate your comment on my staff, and how clean the rooms are. Thank you for taking the time to respond, we are pleased that you stay with us when you come to town. Do not hesitate to let us know if there is anything we can do to make your next stay more enjoyable. 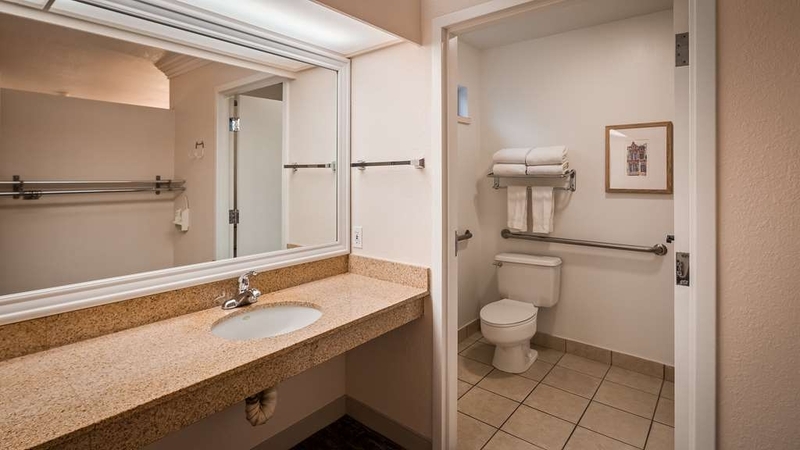 If you're looking for a place to stay in Santa Rosa, try the Best Western Garden Inn. It's excellent! Clean, efficient staff. Great rooms. Nice pool and hot tub. Great little breakfast cafe. Just a wonderful place to stay! Highly recommend! Thank you Debra. We do hope to see you next time you are in the area, your comments are much appreciated. The Best Western Garden Inn was a great experience. I stayed there for 3 nights and the room was extremely clean. The sheets smelled clean every night and the bed was comfortable. There was easy access for parking and getting to the room. Thank you, and I am pleased that you had a great experience at our property. We do look forward to coming to Santa Rosa again. "Clean and comfortable room and beds." Lovely motel, well kept property. Not the best location but not the worst either, Room was clean and had the most comfortable beds. Office personal was friendly and very helpful. Had problem wit billing but was straightened out promptly. . .
We have stayed at this property 4-5 times in the past 4 years. We've been very satisfied and ask for our favorite rooms. The staff is superb, the grounds spotless, and I get the best sleep when I stay there. The room can be made dark dark dark. Lots of good restaurants and popular breweries a short drive away. And the Boot Barn is across the street. Thank you for taking the time to respond. We do hope to see again, do not hesitate to call us when you are in the area. Happy holidays. "Watch out for the California taxes"
This was a lovely place to stay. Very well decorated, nice garden area and best of all very clean. The service was always very good. The only draw back was the cost. We had a reasonable quote on the room but when we got the final bill, there was approximately $25.00 in special taxes added to the cost of the room each day. Were pleasantly surprised by this cute older motel in Santa Rosa. Very nice renovated room with microwave refrigerator and coffee maker in room. Willing to pay the little bit more for a clean quiet place to stay. Great place to stay, and plenty of parking for folks in wheelchairs that have travel trailers. I have a wheelchair carrier towed behind with a trailer, and it was super easy to pull straight in and drive straight out. The motel is very easy to get to, on a main street and right off HWY 101. The rooms are in multiple single story units with parking in front of each room. Although the motel looked older on the outside the property was in amazingly good condition. The room we stayed in was very modern and looked like it had recently been totally refurbished. The room was large with extra seating area and the bathroom was very large. The bed was very confortable. There are two outdoor pools and a covered outdoor spa on the property. There is also a cafe on premises that serves good, and very reasonably priced food (breakfast and lunch). We would certainly recommend this motel and would stay there again if we were in the area. Was a great experience from checkin to checkout. Very clean rooms and property. We stayed in the back section around the heated pool and hot tub. Very quite back there. Nice little pocket hotel. Would stay here again for sure. Nice cafe on site for breakfast. "Very Nice Centrally located hotel for just about any activity in Sonoma County"
We came for Levi's Gran Fondo charity ride with our son. While he was out riding his 100+ miles, my wife and I came back to our room and relaxed until he got back. The location is only a little over 1 mile from the finish line, and it is so close to the freeway that we quickly got to the starting line. The hotel is only a few blocks from Costco and Trader Joes so there was no excuse for not being able to see anything we wanted to see or do. This Garden Inn was much better than I expected. The setting is lovely and relaxing. The guy who checked me in was very friendly and helpful with dinner suggestions. There are two pools, though we didn't use them. Thank you for taking the time to respond. I am pleased that we were better then you expected. I do hope where ever you had dinner that you enjoyed it. Do not hesitate to call for reservations next time you are in town. We've stayed at the Best Western Plus Garden Inn several times now. They've updated the property (even added a hot tub! ), buildings and rooms. Nicely done! The reason we return are the beds - oh my are they comfortable and you get a great night sleep. Also the location is perfect for visiting local wineries and SSU. We'll be back Garden Inn! Thank you luggage17. Pleased to hear you are a repeat guest. 1 more thing to let you know about, we just added more TV channels. Now there are 64 channels.. We look forward to seeing you again. My wife had a doctor's appointment in sanSa Rosa so we needed a place to stay. We use Best Western all the time because of the excellent service we have always received. This stay was just as we expected. Nice to find a place where you still can park your car at the door. Very comfortable room with lovely garden court outlook. Nice bed, hot shower. Good location in Santa Rosa. I would gladly stay there again. All the rooms have been updated. The bathroom is really tiny only room for one person. Staff very nice. Easy access to the freeways. No free breakfast at this location. Pool area super clean. I would recommend this hotel. This is the cleanest hotel I have ever stayed in! We were in the area of Russian River on Labor Day and could not find an approbate hotel, This Best Western fit the bill! It was quiet, clean and friendly. only negative the bed was too firm for my taste. 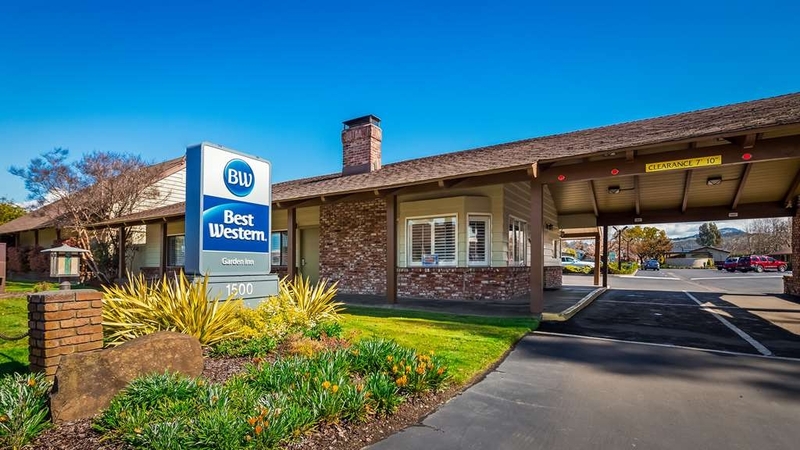 "Great Santa Rosa Ca location"
This Best Western is located in a perfect spot for visiting Santa Rosa and Sonoma County. The hotel has been renovated and the garden rooms are great. Nice decor, good cleanliness, right by the pool, good amenities. Staff was very nice and helpful. Thank you Sandy for your wonderful comments. We returned to the Garden Inn after staying here on our way up the California coast. We enjoyed our first visit due to the wonderful beds, grounds, two pools and wonderful staff. If we travel this way again we will definitely return. Thank you Twinkiefisher, We look forward to seeing you next time you are on your way to the California coast. I am pleased you approve of my staff, and the property. "Affordable Sonoma County option "
After researching affordable options in the area, we settled on this Best Western in Santa Rosa. It was right off the highway (we actually missed it initially and had to loop around!). Check in was fast and easy, and they gave us a map of the property. The rooms were motel style with doors facing the parking lot (no inner hallways). We had a pool view double room, which meant that we had a sliding door out onto the patio with three chairs. We were able to access the pool from there (though you needed a key to get into the gated pool area). We utilized the hot tub and the pool. Towels seemed to be only available at the hot tub. Location was close to a shopping center with a Trader Joe's and a Target, as well as other shops and restaurants. It was less than 10 minutes to downtown Santa Rosa, and Ubers were readily available. The room had a great sized fridge and microwave. Thank you for taking the time to respond. Pleased to hear you researched for the option on hotel prices. Yes we are exterior property, which is the way properties used to be. Its kind of nice just to pull up to your room, and not have to carry luggage very far. The new BW signs are kind of hard to see when driving down the road, The city also has an ordinance on how high you can put a sign. But I am glad you did find us. Please do not hesitate to come see us again when you are in the area. "Sold my suite out from under me Friends graciously brought me down prior to the day I was having surgery." Desperately needed that large room to accommodate the wonderful friends that agreed to accompany me. But arrived to find out my confirmed room was SOLD out from under me. Ended up on a cot. I'm a Gold member for a reason. So very disappointed with my treatment. Second guess staying here anymore. I've spent any nights here. Bummer ?????????????? "My wonderful night at the Best Western Garden Inn, Santa Rosa,CA"
On my first visit to Santa Rosa, my friend and I chose the Best Western Garden Inn. The room was beautifully decorated, the queen beds were very very comfortable with many pillows. The towels were thick and there were plenty of them. The grounds were full of shade trees and beautiful flowering plants. Very importantly, the room lamps had warm light as opposed to the hideous blue LED lights. The coffee pods contained excellent coffee. The room did not have the usual chemical-cleaning-smell. The windows opened and when closed, the AC was quiet and very temperature-adjustible. Front desk service was warm, cordial and efficient. I loved our one-night stay here. Our stay was perfect and comfortable for a family of four. The double queen room was very clean, and we had double shampoo, conditioner, and wash, which was a huge bonus. The most important part of our stay was the amazing young man who checked us in. He was extremely kind, helpful, and pleasant. It was very apparent he loves his job and thoroughly enjoys helping others. He went out of his way to provide us with extra towels and a blanket, displaying it was his pleasure to assist us. Also, we checked out at 430 am, making headway for a 31-hour drive back home, (AR). The lady who checked us out was as equally awesome. She knew we had kids and was not able to stay for breakfast, so she provided us with breakfast grab and go baggies. There are two pools and a hot tub, which are nice and clean. The hotel is about a 1.5 mi walk to the downtown location. The location is off the interstate, but the price is great for a motel of this nature/location. My expectations of this motel were far exceeded. Cleanliness and friendliness outweigh highway location, in my opinion. Thank you for taking the time to respond. It was a pleasure to read your wonderful comments, I am pleased that we met all your expectations. We look forward to seeing you again. Have a wonderful summer. "Overpriced clean, basic motel - good if traveling with large dogs and need a place to sleep." Stayed here on 4th of July hoping to get away from the fireworks at home. Chose Best Western Garden in for their dog policy and generally good reviews. I have two large dogs,so finding a place that allows them both and doesn't charge outrageous pet fees is difficult. Add to that a non-smoking property, and it's nearly impossible. First thing I noticed upon arrival was that this is not in a great area. It's on a commercial strip right of the freeway, so if you're just looking for a place to sleep after a long day of driving somewhere, this will probably be great for you. If you're looking for a place to hang out and relax for a few days, this is not it. Upon check in the front desk guy told me check in was at 3pm (website says 2pm) and he was initially a bit snappy. I think because I was apprehensive about the location (right off the street) and the room assignment. I'd made a request for a quiet, renovated room based on the reviews I'd read. I learned that the renovated rooms are not pet friendly. Oh well. After a little back and forth, the front desk guy found me a room further away from the street and also ended up being pretty friendly. The room was ready and we did not have to wait. No issue there. This place is fairly large and has two pools and a hot tub. There is a very small patch of grass at the front of the property to take dogs to the bathroom. It was in good shape. The pools looked basic but clean and in good shape. The older part of the property (where we stayed, is a basic, two floor structure with exterior doors. My room was on the first floor (I believe all pet friendly rooms are), and was quite large. All pet friendly rooms are double queens. I'm not sure if they expect your pets to have their own bed or what, but I would have preferred a singly king. Still the room was clean, large enough for a large dog crate, and could have had two crates set up if need be. The bathroom was split with the toilet and bath/shower separate from the sink. The shower room was odd. No cabinet, no trash can. Just a toilet and bath. There was a single narrow window way at the top. The exhaust fan did not work. The light turned on, but the fan, which had no separate switch, did not. The sink area had a mini fridge and a microwave. The bedroom area had very little. A large TV, a table and chairs and a night stand. But it was clean and did not smell like air freshener, so I was happy about that. As soon as I walked out of the room, I encountered a young couple smoking cigarettes about 15 feet from my door. This is a supposed to be a smoke free property. I don't know why smokers choose smoke free properties when there are still way too many properties that still allow smoking. Not pleasant. There are not many places to eat near the hotel. I did not try the cafe. It was closed when we got there on July 4th around 2pm. Downtown Santa Rosa is less than 1.5 miles from the motel. Very easy, flat walk. The walk is much more pleasant and interesting about 1/2 way there, as you'll pass Julliard Park and Luther Burbank home and garden. The neighborhood behind the hotel is kind of run down. In the evening I saw a tweaker looking woman walking around a more deserted area of the parking lot. When she saw me she went over to a car parked away from the rest and stuck her head in the window and just sort of hung out there. I'm pretty sure she was not staying there. Later I saw a similar looking guy wandering around. After midnight I took my dogs out just as a car sped into the lot with music blasting. In the room it was fairly quiet (fireworks not withstanding), but the people above me were apparently jogging back and forth in lead boots until 2am. Or the floors are not that thick. Finally, the mattress was very soft and uncomfortable. I am a small person. They need new mattresses and smaller pillows. Why do all these places think 6 huge pillows on each bed is necessary? Please provide some normal size/thickness pillows for those of that don't want our necks at a 90 degree angle when sleeping! To sum up- this is a clean, basic motel with fairly spacious rooms and a very good pet policy. The price ($134 with AAA), is way too high for the location and amenities. 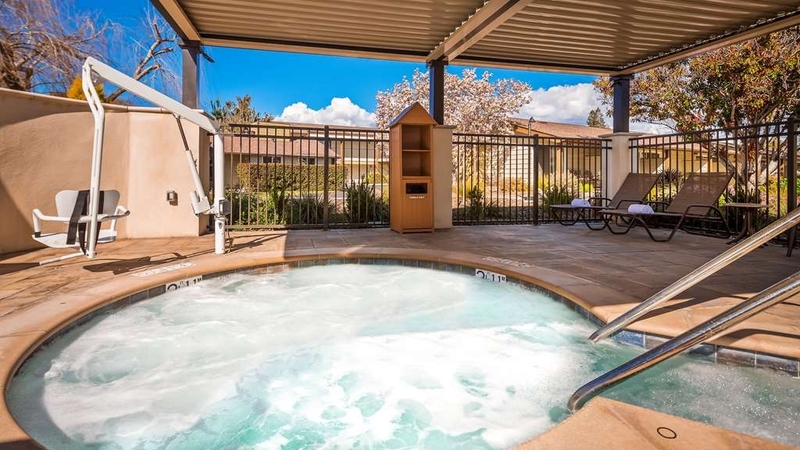 I've stayed in places in Calistoga for about the same price, and had the luxury of hot spring pools, garden setting and extremely close proximity to lovely restaurants and shops. If you are traveling with large dogs and need nothing more than a place to sleep for the night, this would work, but for anything more, I'd say keep looking. "Must stay hotel! Cute, cozy, and comfortable!!" Our family just did a trip out west from Ohio and stayed in 7 different hotels over the course of 10 days. We stayed at the Garden Inn for two nights, and it was our favorite place by far! It looked a little older on the outside but the rooms have all been updated and were very nice! Everything was very clean! There were multiple pools, our rooms had patios next to the pool and a fountain with benches to sit in! Our days were filled with activities and both nights we sat outside at the pool surrounded by beautiful landscaping! We were also able to do some laundry here, and the laundry room was also very clean! I would definitely recommend it to anyone in the area! This place was great. Absolutely clean, well appointed rooms, with great mattresses. Enjoyed the hot tub. No breakfast, but morning coffee was really good. I left a jacket there and they mailed it home to me right away. Very quiet, everything a person needs. It was, however, tricky to find. My gps did not like the address. Once we realized it was next to a Les schwab we just put that in. The property looks quite average from the street, but it's really quite large and has lovely grounds. Thank you for your wonderful comments on our property. I am glad that we were able to find your jacket and mail it to you. I thank you for for the comment on the property looking average upon check in. until you saw the the whole property for what we have to offer. Please come see us again. "Nice clean motel, convenient to many attractions and shopping." Rooms are clean and quiet. There is a small restaurant on side for full breakfasts as reasonable prices. The Charles Schultz Museum is nearby and there is easy freeway access north and south. We go for doctor appointments and facilities are just 10 minutes away. Than you for taking the time to respond. I am pleased that our hotel meets your needs, Please do not hesitate to let us know if there is any thing that we can do to make your next reservation even more special. We were there during busy graduation weekend in area, upon arrival to office there was a line and I was very impressed with the professional way and patience the Desk Clerk as each person checked in. The room was clean, internet nice and fast and just what we needed for our stay. My wife had to have eye surgery and we weren't allowed to go home because she had a gas bubble in her eye because of the surgery. We had to stay in Santa Rosa until her doctor said we could drive back home because of the changes in elevation. "Well, let's see . . ."
Pricey. But, the garden room was big. Would we stay here again? That would depend upon whether competition in hotels has returned following the terrible fire they experienced in the area. We have stayed in much more modern places for less money. The cleaning personnel were very good. The front desk is lacking in hospitality. But, the area has experienced a terrible fire devastation and allowances must be made and considered. No breakfast included with room price. It should. Excellent stay, peaceful, quiet and very clean. I don't remember staying in a nicer room. It was in a single story room with a comfortable king bed. The room had a sliding back door that had chairs on a porch looking out onto a lovely garden. The pool and hot tub were steps away but we never heard anyone. We would definitely go back again! "BW Garden Inn Santa Rosa Ca"
It appears this is an older property, but is well maintained. The room was spacious enough, but was still a little tight. This property is another with low water pressure, like others I have been in. Everything else in the room was satisfactory. There was no complimentary breakfast, but there is a restaurant there to have breakfast. The prices were very reasonable, but a limited menu as I would expect. Overall this is a good, clean motel. I will stay here again. "Very good for a bargain hotel"
This place has recently been renovated. The rooms are nice, large, well furnished, etc. It is right off a main road, but our room was quiet and the hotel is conveniently located. I'm sure you could pay more for a more luxurious place, but this hotel was just fine. What's not to like? Thank you for providing us with comments, I am glad that we are conveniently located for for your stay, and you noticed our recent renovations. We look forward to seeing you next time you are in town, do not hesitate to let us know what we can do to make your next stay even more enjoyable. "Could be nice, but is a noisy hotel"
Comfy beds, with big clean rooms. Spent two nights. First night I was in a room just past the first pool which was super noisy. There was all sorts of chatter from hotel staff as well as guests and their cars in the parking lot. Some road noise as well. I asked to be transferred to the Garden area, and they complied. That room was much nicer, and quieter, but then the second morning they had staff with a leaf blower at full tilt for about 40 minutes at 9 am. I live in the Bay area and went up for a little break from the big city but found myself in place with plenty of noise and activity instead. The jacuzzi and pool were great. But, otherwise typically overpriced hotel in Napa in convenient location. Great room, Very clean and quiet. Great staff, friendly and helpful. Came here on business and checked in quite late and was very tired. they had excellent customer service. Will stay here again when in this area. The hotel was adequate, but very overpriced. The room had ants on the vanity in bathroom area. The hotel had a restaurant, but didn't offer free breakfast. The hotel was very convenient to Highway 101. "Nice and Clean - Comfy Beds!!" Ok, so the area surrounding the Hotel is not great; but the hotel itself is beautifully maintained. The rooms are pretty, the beds are really comfortable. We were in Santa Rosa for a wedding and the other hotels I tried to book were full or stupidly expensive. I would definitely stay here again. There is a breakfast place right on the grounds (i.e.bacon eggs and pancakes) - also clean and decent. Prices for the breakfast ran about $8. Truly enjoyed our stay here. Staff was responsive as soon as we walked into the office. We were given a room next to the heated pool, which my children enjoyed, with a sliding door to the outside ++. We met other families there who swam in the pool. Rooms were nice and clean, spacious. The grounds were well kept. Parking was right in front of the room. We did not go to the breakfast, though they do offer breakfast for a fee which is a nice convenience for families. At night it was quiet and exterior lighting was good. Close to all amenities and the highway. Will stay here again. Thank you for taking the time to respond, I am pleased you got to enjoy the pool, and join in with your family members. Next time join us for breakfast, I sure you will approve. We look forward to seeing you in the future. Room exceptionally clean and quiet. Property well lit for access to pool, vending machines and a walk around the facility. Will definitely stay here again. Easy WiFi, extremely comfortable clean beds. Sliding glass doors to access pool area but quiet when closed. Staff friendly upon arrival and very helpful when locating room. Thank you. Had a very nice quick check in, which at midnight is really welcome. Comfy bed, very quiet. Found out they are pet friendly so will keep this spot in mind for trips with pets. The hotel is right next to some great shopping too. Very pretty and clean property, has 2 pools and a nice hot tub all set among nicely landscaped grounds. Most rooms are on ground level, great for limited mobility people, or those traveling with pets. We felt very safe walking around in the evening. They have a restaurant that was supposed to be open for meals but was only for breakfast which you have to order and pay additionally. They could not accept any credit cards, cash only, you can bill to your room however. The room was very comfortable and clean! Nice linens and comfortable bed. "For the price, I expected the room to be vacuumed"
I stay at BW a lot because I have a dog, and this is generally a nice one. However, it's quite expensive, and they don't include breakfast in the price. They have an onsite cafe, but the one time I tried to go there, I waited by the counter for a while and no one ever came out to take my order. On a recent visit I arrived at the room and noticed my dog sniffing around with a little too much enthusiasm. I got down on the floor and found fragments of half-eaten snack foods. In the end, crawling around on the floor of my $250/night room, I found a partially eaten Oreo, pieces of an M&M, and 2 candied nuts. Disgusting, potentially dangerous to my dog, and completely unacceptable. Then the next door room blasted their TV until 2 a.m., disrupting my sleep, and my experience was complete. My partner and I come to Santa Rosa roughly every three weeks due to an elderly family member who lives here. Our regular hotel was sold out so we booked the most reasonable non-scary chain place we could find. That place was the Best Western Plus Garden Inn. We were very pleasantly surprised. The hotel had recently undergone a renovation and it showed, inside and out. Beyond that, the property was exceptionally clean. When we drove in, we saw a woman sweeping a walkway, and that attention to detail and cleanliness showed everywhere. This Best Western does not have a complimentary breakfast, but they offer very economical breakfasts which we enjoyed. For example, two eggs and hash browns and toast for $4.95, and coffee for $1.50. (They also serve dinner.) Our room was a standard king and it had plenty of room, but there are a couple of wings that sport larger deluxe kings which we were told were only slightly more expensive. This part of the motel has it's own pool and spa, and beautiful landscaping. Don't be put off by the rather dreary and noisy commercial landscape on busy Santa Rosa Avenue. The hotel is quiet and really pleasant. Front desk staff was great. For an economical hotel option in Santa Rosa this is clearly the best. It's a short drive to downtown Santa Rosa and Railroad Square. One of the best features about this Best Western, is you get to par right in front of your room. This was super convenient! The rooms were nice, newly remodeled. I would definitely return if I'm in the area again. The location was close to quite a few restaurants and all sorts of shopping. In general this hotel stands by the standards of Best Western but it suffers of two major setbacks that made our stay there less than very satisfying. First, the hotel is too expensive considering the fact that it does not serve a free breakfast and the bed is a queen size. Second, there is no chair in the room, just two armchairs. This may be reasonable if what you want is just to relax and watch TV, but if you need to use a laptop and you have urgent matters to attend to, which need the use of the internet you easily get frustrated. Thus, I'm ambivalent about this hotel. I would hesitate to come back if I'm in the area again. Therefore, I would hesitate recommending it with no reservation. Honestly, we dreaded this particular area of Santa Rosa since we are familiar with Sonoma. What we did not expect was a delightful extremely clean modern courtyard room. The back garden area is simingly new. It has sliding glass doors that open to lovely courtyard with a water fall bird bath lovely patio with chairs and table, benches, and a nice pool. The room was quiet, spotless, and the beds were the nicest beds I've had in lodging in years! We were so surprised! Hugh TV fridge microwave and all the little perks like water soap shampoo coffee. The coffe is typical lodging crappy coffee and the awful powdered milk bit it was fine and the little property restaurant is literally across the patio. The restaurant breakfast was wonderful fast and cheap. $7.00 got is three giant pancakes, three slices of bacon and two eggs with all the trimmings. We couldn't be more pleased. Santa Rosa Avenue can be seedy but this property sits back off the street and the garden area is way back and perfectly safe. Wonderful. We have found a new home away from home while in Santa Rosa. Thank you Katherine. Your response is very much appreciated, You have pretty much covered all what we have improved on our property in the last year. I do hope that you will be back to stay with us in the future. I will work on the coffee in the room Also we have coffee in the office in the morning. "Could Have Been Perfect, but..."
This sounds nit-picking, but I just couldn't understand "why"! The room was perfect in every way: the carpet looked new, the "water closet" was spotless and had a timed ceiling heater, the dressing area was large with plenty of closet space and two luggage racks, the bedding was very pretty and the pillows were perfect, the TV was large and swiveled for good viewing around the room, there was a table and two chairs, refrigerator, microwave, and a beautiful view of a pretty garden area out the back sliders. Sounds nice, right? So, when I looked down and saw the bed skirts on the plump beds, it didn't make sense: they were crumpled and crinkled as though they had been wadded up in a corner somewhere, or had sat in a washing machine until they dried (with big deep wrinkles) and then hastily stretched over the springs before placing the mattresses. So odd when everything else was meticulous. Super room, though. Thank you for giving us your opinion. I am pleased that you enjoyed your stay and we look forward to seeing you next time you are min town. If there is anything we can do to make your next stay more enjoyable lets us know. In an area of hotels right on the roadway this is a little garden oasis that moves you back away from all of it. Nice gardens, fountains, pools, hot tub, etc. One of the better ones for the area. When working in the area I stay here as often as I can. Doesn't look like the greatest neighborhood when you are on the street getting there but was very quiet. There are 2 pools and a jacuzzi (it was cold so we didn't use them but nice amenity for another time). On site restaurant was open for breakfast but closed for dinner. There are a few fast food places and a liquor store in walking distance but I probably would be hesitant to walk much in the area after dark. Thank you Glenn for informing us on you stay. I am sorry for the problems that you encountered. I noticed on your check out that you mentioned the tub being clogged, we sent our staff to clear the drain when you checked out. There was no mention of any thing else. We do hope that you will give us another try. We were pleasantly surprised at how nice it was! Great value! Large, comfortable room (great beds), hot tub and pool (pool was heated which our daughters enjoyed). The grounds were lovely - truly a garden inn! Coffee and breakfast were great at the restaurant. Can eat in or take food back to your room. Would recommend this hotel. "easy access, very nice grounds, lots of parking"
I stayed here for a few days while exploring wine country... easy access to the highway ,staff were helpful and friendly, my room was neat and clean and the grounds were well maintained. It was fairly quiet and a safe location. Thank you JR i do hope you had fun exploring the wine country. Please do not hesitate to call us next time you come to wine country. If there is anything we can do to make your next stay more enjoyable, lets us know. "Stayed one night great experience"
We stayed one night as we were in town to see Dwight Yoakam at the Luther Burbank Center. Great hotel for short stays in my opinion and the staff is excellent. On the exterior it's an older looking hotel but our room was modern to todays hotel standards and the room was very clean. When we arrived our room wasn't ready but they gave us an identical room further away from the front office. We were ok with that because there wasn't much foot traffic near our room and at night it was very quiet. We heard no road noise. I would stay there again for an overnight or 2 day stay. We decided to stay in our room right up to check out time so we didn't try the restaurant on the premises. I can't comment on the food. Also worth noting they have HBO if thats your thing when you stay at hotels. Thank you for giving us your opinion, I do hope that you enjoyed the Dwight Yoakom show. Please come back when you can stay a little longer and enjoy our hotel, the summer or spring are a great time to come. You can enjoy sitting outside in our garden area and use our spa, and pool. We have just recently renovated all our rooms, So I am happy that you noticed the modern look a well as the room was very clean. Please to not hesitate to let us know what we can do to make your next trip more enjoyable. Newly updated rooms,central location and pet friendly. We have been staying here whenever we visit family since leaving the area 12 years ago. We enjoy the extra large rooms and location. It was great to see the city of Santa Rosa lives on,stay strong! Second time staying at this BW, first time in 2002 but did not write review. Personal business trip. Good location near downtown Santa Rosa so worked for me. Several stores/restaurants nearby which was convenient. There is no free breakfast offered here, but there is a café on premises with small menu that worked well for me as I was tired. Had dinner here and breakfast next morning, both times was good eats. Check in fast and easy. Parking is ample for guests, generally all in front of rooms. Room clean and all in working order. King bed was a little hard but OK, great pillows for sleeping. Large flat screen TV's with Dish Network channels, microwaves/refrigerators in room. Generally quiet location even though it is located just off of busy Santa Rosa Ave, so that's a plus. There is pool but did not get to partake. Business office has two computers and printers for guest, both worked well during my stay. Had a good stay here (as I did on first visit) and would recommend this place to others. Only negative during visit was had no soap in shower, and no "do not disturb" sign in room during my stay, but, trip to office to obtain both solved that. "It's almost a solid 4 - and we are Marriott lifers"
So reviews are all about perspective right? We live comfortably and have grown pickier and pickier over the years. And I wish Trip Advisor would ask for really detailed reviews like bed comfort, water pressure, etc. Those are things I really care about and want to know before I book. I didn't realize it was a "motel layout" meaning all the rooms are accessible from the outdoors so there is no indoor common area at all. It was mostly quiet but that could easily change if you had noisy people outside. This place had a very good mattress. The pillows were a little on the thick side. No down pillows here, just a head's up. The TV was very nice - a Samsung - larger than the room required so that was nice. The place was very clean and looked more expensive than I would expect at a Best Western. The shower and toilet are in a separate room from the sink and changing area which is convenient when you need to have separate spaces. We didn't use the "kitchen" but it's in the same area as the bathroom sink (the microwave and fridge) which always makes me a little queasy. The water pressure was okay, not great, but good enough. "Clean and friendly for the price"
Rooms were clean, beds were nice and cozy, wifi worked well. This is not an expensive hotel so for the price, it was worth it. Easy on/off to 101 and close to downtown Santa Rosa. A good place to stay. Thank you, we look forward to seeing you again. I am pleases that our property met your needs. We do try try make it cozy. "Best Western Garden inn good quality stay"
The hotel, while older, had rooms updated and very comfortable. Rooms were large, clean and well appointed. Had a very nice stay for our whole family. The family room was awesome- three large beds, two rooms!!! "Run down motel and noise issues"
Sorry you did not enjoy your stay. Sounds like you did not approve of anything. By the way the printers are working just fine. Very happy with the ambiance of this hotel. The garden courtyard was beautifully kept. Rooms had large sliding glass doors with chairs and a side table so you could sit and enjoy the garden area. Staff was very pleasant and helpful. "Best Western Garden Inn Santa Rosa"
I am a traveling service technician, on the road for 250 days per year. I always stay at best Westerns so I know what to expect, and have certain expectations from this hotel chain. The Garden Inn not only met my expectations but exceeded them. The staff is wonderful, well trained, and helpful. The rooms are comfortable, and beds comfy. I slept well!! "Great Place - quiet and charming"
We had a garden room and it was fantastic. It was very clean, very comfortable, large sink and vanity area, and plenty of space in the room. The large sliding doors and view of the pool was a bonus - Definitely going back - I sure hope this survived the recent fires! Thank you Sue V, so pleased to know that your room in the garden area worked for you. I just want to let you know, next week the rooms in the garden area will be updated. So we can not wait for you to return, and let us know what you think. Missed reservation due to losing home and auto to Hurricane Harvey - displaced from home for 4 weeks before I could move into an apartment. National reservation system did not send my cancellation reference to Best Western Garden Inn in Santa Rosa. They explained they were at full occupancy, yet the national new (ABC, CBS, NBC) reported evacuationnotices for Santa Rosa Ca. for the dates involved. Dear James, I am sorry that you felt we did not care. We do care and have refunded you the full amount. We never received a cancellation for this reservation. We held this room for you. If we had showed that it was cancelled, we could have sold this to someone that really needed the room that was misplaced by the fire. Again you have been refunded, and we are sorry that you were evacuated by Hurricane Harvey. "Bring large can of Lysol"
I have two positive things to say: The restaurant was very good. The a/c unit was not working when we arrived. I reported it to the office and "Angel" replaced the unit. NEGATIVES: Donna Renterla, GM, is quite terse and lacks customer service skills. She put me on the defensive immediately when I was speaking to her about our reservation. Our room's carpet was filthy. The bathroom floor was filthy (picture attached). The toilet would run constantly - I reported it and it was not fixed or not fixed appropriately where it would stop running. The top cover sheets were stained. The coffee service was not consistent: some days there were coffee cups, coffee, sugar, etc., other days - nothing There were ants on the items by the coffee service, and in the bathroom (picture attached). The entry door to the room was lacking weather stripping at the corner of the door - light and bugs were coming in through the opening. Computer office: wanted to print our boarding passes. One computer did not work and the front office lady told me she didn't know how to work it The second computer's printer did not work either. NOTE: your front office staff should be trained on how to work the equipment in the computer room. Dear Powerlifter, I just do not know where to start. You have many items that did not meet your expectations, I do see that you made this reservation through central reservation. I did not speak to you about your reservation, But I did tell Angel to replace the air conditioner, and I called you to let you know that we were replacing that. I do see that you were here for a week, If I had known there was so many problems, we could have moved you to another room. Again sorry for all the problems you had. 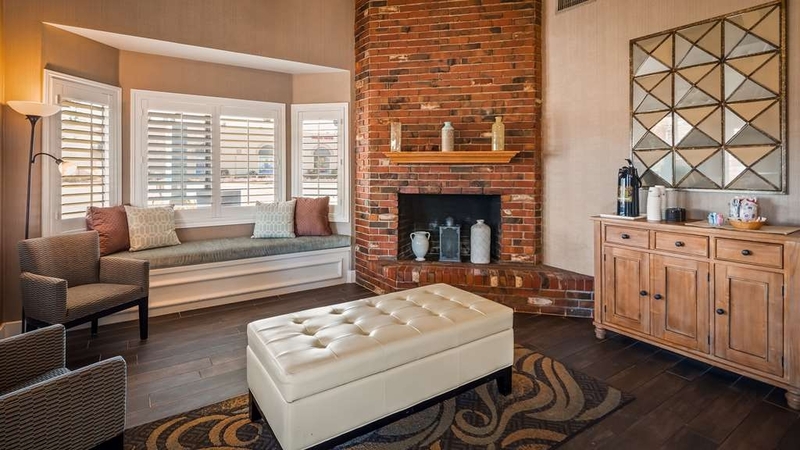 We were impressed with the appearance of this remodeled property. Great value for a comfortable stay. The hotel location was good, not far from the Santa Rosa railroad depot, fine restaurants and the walkable City Center. I have stayed at this hotel about 6 times in the last few months and I can't say enough about it, All of the rooms are excellent, quiet, clean, roomy and as a senior female traveling alone, I feel quite safe. The on site restaurant is perfect for me in the norming, the staff is always a joy and the food is wonderful. Because my trips to Santa Rosa are medical, I like that the motel is close to the office for me. Over all property very comfortable. Older but clean. Large comfortable rooms with pleasant of space. Appropriate room amenities. Gave u the feeling as if staying in a small bungalow. Even has a restaurant on site. The food was good but restaurant service is very poor. I will stay there again because it was very comfortable but not eat there again unless restaurant service improves. Thank you Uncle Philvw. Sounds like you had a room in the garden area. I am you like the feeling that you are staying in a bungalow. Next time you return those rooms will be all changed out to the new furniture, and carpet. as well as new flooring. I am sorry about the service in the cafe, sounds like the day that someone called in sick, and we were short handed, I do hope that you try our cafe again. A very nice, clean property with multiple pools and an an on site cafe that has very reasonable prices. Trader Joe's is just a few blocks away. Comfy, firm beds with great TVs and reliable satellite TV and wi-fi. Thank you for your recent reply, we are always pleased when our guest have good things to sy about our property, We do look forward to having you come stay with us again. Hubby and I arrived late in the evening and this hotel was right across the street from Denney's restaurant. We were able to grab the last available room for the night. Even though it was just the two of us we had the family suite. Overkill for us, but it was roomy and comfortable and quiet and convenient to the hot tub. The water temp was perfect, dark and romantic, clean and quiet. We will definitely use this property again on our next visit to my hometown. The staff in their little café are friendly and funny. Clean and comfortable as well. Food was yummy, coffee perfect. Two thumbs up from me and two from hubby. Usually I find at least one thing to complain about, but not this time. Thank you Best Western Garden Inn, well done. Thank you for taking the time to respond. Pleased we had room available for you . I love reading responses like yours. I cannot wait for you to visit your hometown again. Give us a call any time for reservations. Put in a request for the garden area. Again thank you. Visited Santa Rosa for a wedding. Lobby decorations are updated. Room was spacious. Bathroom does not have a fan, so it makes it very humid when taking a shower. Most definitely you have to go out to the room to get ready and some cool air. AC unit was very helpful to maintain the room cool. Found some hair on our sheets. Nights were quiet. Overall it was an average stay. Room was spacious, comfortable and very clean. The grounds were impeccable and hot tub was relaxing. Great location right off the freeway exit, but not a lot of street noise. Not too many options for restaurants nearby, though. Thank you for taking the time to respond. Pleased to hear that our rooms and grounds met your expectations. When you return to the area, give us an idea what you would like for dinner. We would love to tell you about the many restaurant that are only 1 mile from us. . Again thank you. This is a motel, with exterior doors, in an old part of town that you wouldn't want to walk in. There's no free breakfast, and the staff isn't responsive to problems. And for that, you get to pay over $200/night depending on the time of year. Santa Rosa has become an expensive destination and doesn't have the competition it needs to lower the price, but given what they are charging, you'd expect them to raise the quality with their added income. It isn't happening. Thank you for your response, However I do not show you as one of our guest. Maybe the room was under some other name. If you are talking about our property, I am sorry that you do not approve. We actually finished early this year with the two story building renovation. Starting November we will be doing the one story building. The back landscaping and spa and back were done last year. So yes we do put put our money back into the property. We also updated our cafe. This motel was built in the late 50's. It has been beautifully maintained with nice grounds and it is quite large. The double-queen rooms are large and well-equipped with a microwave and refrigerator. The is a small cafe in the center that serves breakfast and dinner. Wine and beer available. There is a pool and a spa. The location is excellent for trips to the wine country, shopping, etc. An excellent value. Thank you William for taking the time to express your thoughts on your stay. There are not many people that see our property quit the way that you do. You have noticed the pride we take in keeping our property up to date. We do hope to see you next time you are in town, again thank you. Quiet motel. Helpful and friendly staff. Comfortable bed and clean room. Nice in-room amenities, refrigeration, microwave. Good internet conductivity. Good location Overall motel was very good. Would definitely stay here again. "Shows Real Pride of Ownership"
This is a nice clean motel that shows a real pride of ownership. The grounds are kept very tidy and clean. The rooms are large and well lit. A good place to stay and they allow a pet. The bathroom is large and has lots of closet space. Ic you are visiting Sanoma wine country and want a nice base, bookk here. Property has been updated, is super clean and a great value. Santa Rosa is not a quaint town, and the area area around the hotel is what it is. But it shows as a low crime area and we felt fine here. There is an excellent on property restaurant with a great breakfast menu. Friendly staff and in room coffee, fridge and microwave. We stayed 2 nights. EZ on & off US101 and perfect for cruising route 12 wineries. From the outside, the hotel looked well kept. There's a large garden, well maintained pools and hot tub. But our room had a few issues. First, there was a shower cap on the smoke detector. Probably because the previous guest was getting away with smoking in a non-smoking room... but I didn't want to assume and waited for housekeeping to remove it. After two nights, they never removed it. This could be because of housekeeping's lack of attention to detail. From day one, there was a huge stain on the wall like someone threw a pizza at the wall and it stuck there for a couple hours. It's partially covered by the front door, so I can see why they *might* have missed it, but come on. The "black out shades" never really blacked out the light. We could never get them to close completely. The air conditioner was also buggy. You could get it to turn on for a while, but once the room met the desired temperature, it shut down and wouldn't come back on again until you manually turned it on. I booked the resort online through Best Western. It was a far better price than actually calling the hotel it was about a $50 difference per night. Check-in was friendly and easy the staff was very helpful. The on-site Cafe was a nice surprise the food was good and the service was excellent. The rooms appear to have been recently remodeled they were open Airy clean fresh and very comfortable. We are very pleased with the location and just about everything at this hotel was accommodating. I would stay there again and I recommend this hotel for your stay in Santa Rosa. We were very comfortable at this Best Western. Despite its location in a more industrial area of Santa Rosa, our room was quiet, clean and attractive. Our 2-bed room was also larger than the one we stayed in at a Best Western charging considerably more. I enjoyed the accommodations as it is centrally located near medical appointments and restaurants. I appreciated that I could park right in front of my room, the room the garden/pool area. Guests were quiet that evening and I had a great night's sleep. Thank you Sheilaf51 Pleased to know that our hotel met your needs. Do not hesitate to let us know when you are coming to town again. Also I do hope that you are a Best Western Rewards member. I want to make sure you are taking advantage of the points being rewarded for your stays.. If not let us know. 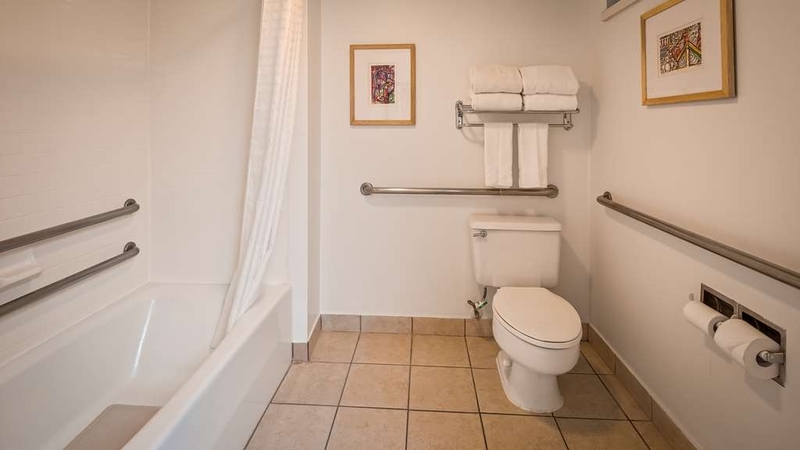 We had a handicapped room with a large shower. Rooms have been up-dated. Restaurant on premise for breakfast- can apply bill to room. Two swimming pools one with sauna. Very quiet. Acsessible to downtown Santa Rosa. Thank you Mac for taking the time to give us your comments on Tripadvisor. I do hope that you tried our cafe, not only do we have breakfast, we also have dinner. We do look forward to seeing you when you come to town again. i had an awesome experience i will definitely book again. The hotel rooms are very spacious, the pool is right by a bbq grill and a mini golf course. My kids loved it. It was perfect. We didn't need to go out of our hotel to have family time. we had family time right then and there. We went and bought ribs and some meat to bbq. It was perfect. they had patio tables there as well. Very friendly environment. Our room wasn't ready at 2:00 which is check in. We waiting another 45 min and our room was dirty. There was long blonde and short black hair on the shower. There was a huge brown stain on the white comforter and white sheets when I pulled them back. I don't want to wait for my room and then have to clean it myself. Really enjoy staying at this Best Western. Our preference is to stay at a hotel which has a garden. Even though they are on a busy road it is always peaceful. Rooms are very clean and large. Most comfortable. "Is the Very Nice Room Decor worth it?" Hands down, the room decor is among the very best experienced at any BW property. There is no doubt that the owners invested some time, thought and dollars when they revamped this property. There is no inclusive breakfast, pastries, or morning newspaper. The small outdoor pool lacks a hot tub. Their excuse is that they are not a "Plus" property. OK. Then charge less than $134 - $179 for the basic room. 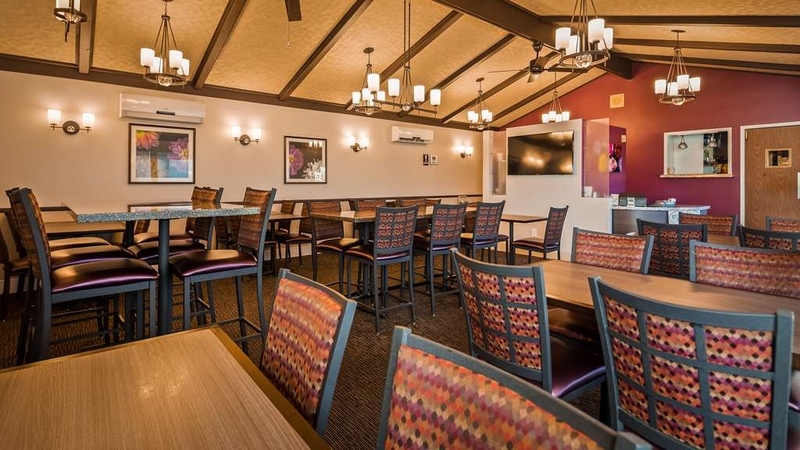 The price point collusion game that BW is playing with its franchisees is an issue in its own right; but what you are paying for here is a very nice and well decorated room. Have you checked the Flamingo or Hilton on a comparable. You might be surprised. You can also go down the road a few minutes to the BW in Rohnert Park. Traditional 2 story motel with a basic continental breakfast, nicely appointed rooms, and a hot tub with a larger pool for $96 on CLC. Not the same tranquil garden style mood, but if you're in town for a few days you can enjoy some very nice dinners for the price point difference! Did you know that if you walk in without a reservation and ask for a room, the minimum is $179...but...if you magically produce a AAA or AARP card, its only $134? Seriously...is this a ruse or what? Its always just a matter of what you want to pay for and we'll give full credit to this property for providing a very enjoyable in-room experience with a large modern TV. Have your food delivered and you've got it made wthout the hot tub. Thank you for taking the time to give us your wonderful remarks on our rooms. I am sorry that you did not see our hot tub. it is located across from the cafe. It is a wonderful addition that we added last summer. I see you had a rate of $134.00 + tax. Right now we are on summer rates. We are actually a lot less than the Flamingo and the Hilton. We do hope to see you back at our property. I do hope that you try our cafe next time. Great home cooking. Everything is cooked to order, not sitting in a chaffing dish, or out of a package. Stayed for one night in an upstairs 2 bed room. Room seemed to be clean, beds were comfortable. It's a large property fairly close to the freeway, but the road noise was muted and not intrusive. We had breakfast at the on-site restaurant with reduced prices. The breakfast was very good and service friendly and efficient. Check-in was a bit of a hassle due to one cantankerous guest. However, the check-in hostess handled his unreasonable demands quite graciously. Check-out went without a hitch. Would stay here again when in the area. Great place to stay. Very accommodating & friendly. The Garden Cafe on premises is nice, good food & really reasonably priced offerings. Three options for a relaxing dip at the end of a travel day is a nice plus. Heated pool, an unheated pool & a hot tub. We'll be staying here again!!!! Comfy bed, we slept well. Disinterested staff, neither rude nor friendly. Expensive for the quality, almost $300/night for a motel feel. Clean except for a little mold on the shower door. Overall acceptable. Thank you for your response. I am pleased that you slept well. Your rate for the room you had was $239.00, it was the weekend, and that is when the rates are higher, as well as summer time. I will have my crew take care of the mold in the shower. Thank you for bringing that to my attention. Next time you are in the area give us a call for reservations. The Best Western Garden Inn is a wonderful Motel. The two swimming pools make it convenient. The little restaurant is perfect for a light meal. It's close to all kinds of interesting spots example Russian River, Korbel winery, Montgomery Village, and most of all lots of restaurants that are delicious. Thank you Kathy for your wonderful comments. It always makes be very pleased when my guest comment on our property. 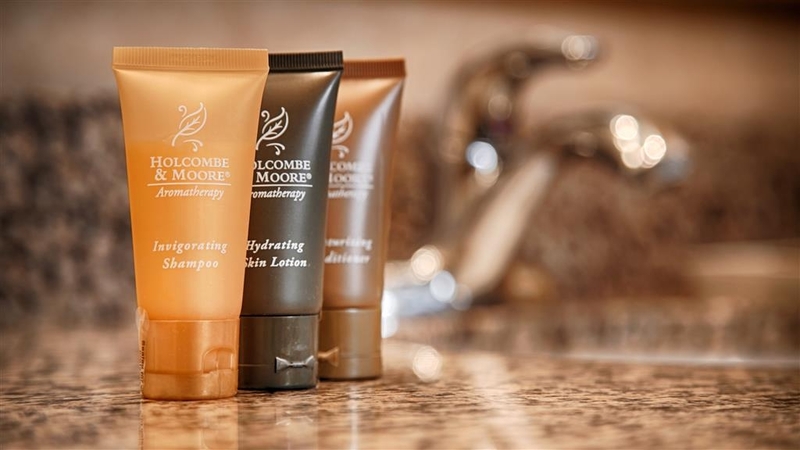 If there is anything you can think of to make your next stay more enjoyable, just let us know. Enjoy the rest of your summer. I was surprised to find this a very clean, well appointed motel that extends further from the busy commercial street than I had thought possible and our stay was pleasantly quiet. The little cafe attached to the motel had nothing we wanted to eat so we walked down the ugly street, crossed over trepidatiously, and found a Mexican restaurant booming loud, loud music so we settled on Denny's. It surprised us that we found a very edible entree. A friend who owns a bed and breakfast stays here often and she is fussy about cleanliness. That's why I took a chance but now I would definitely stay here again if I didn't care how commercial the neighborhood is. Thank you for staying with us. I am glad you and your son had a good time. Be sure to come see us again. They charged $230 a night. There was ants crawling on the walls and on me. There was no hot water in the morning and was unable to take a shower. I would advise no one to stay here. They have poor customer service skills, told us we had to wait until the manager got there to complain. We appreciate you taking the time to express your thoughts. We are sorry about the hot water, the regulator went out, and it was on a Sunday, However we had a company out in the morning, it was fixed by 10:30 am. My clerks are not going to tell our guest that they have to wait until the manager arrives to complain. They are trained better than that. So again please accept my apology. "Bugs and no hot water, but plenty of rude"
This hotel has a lot going for it, but unfortunately all of that potential is lost because of bad customer service and lack of hospitality. On our check in day (Saturday, July 1) I tried calling the hotel several times between 1-3 pm. Each time I listened to a couple minutes of the pre-recorded announcement touting all the hotel "features," when that was done, the system promptly hung up on me. Fun. We decided to skip on of our planned stops in Sonoma so we could check into the hotel during daylight. That turned out to be a good call. Our first room (139) was infested with bugs: ants and earwigs. The lady at the front desk was nice and apologetic, and moved us to a new room in a different building (133). The room was nice and was probably an upgrade, since it had a little patio that faced the pool. This room had a couple of ants too, but I didn't feel like going back to the front desk, and figured they probably all had ants anyway. The rooms are upgraded, have good amenities, and the bed was comfortable. But on Sunday morning, things took a turn for the worse. No hot water, not even lukewarm - cold water only. A quick call to the front desk yielded an exasperated inform that the water heater was broken and they were trying to fix it. Was there an ETA? No, no idea when it will be fixed; openly rude. Boy, did I feel silly for bothering him with these stupid questions and outrageous desire for a hot shower. We waited for a couple hours thinking it might get fixed, but finally had to leave and check out at 11. We went to the front desk, hoping we would get some kind of compensation for the lack of hot water. We were not the only guests there, another couple had the same idea. But Bruno, the front desk guy was having none of it. No discount, no refunds, no apology, just another dose of rudeness. There was no manager on duty, and he was reluctant to give her full name; Donna, just Donna - everyone will know who she is. Since I booked through an online service I called them to get a refund. They have to call the hotel and verify the problem, lo and behold, they were hung up on too. After an hour, they were able to reach a human, Bruno and he was rude to them too. At least he's consistent. It took them 5 days to reach a manager and they were denied a refund :( I wouldn't recommend staying there; for the cost (>$250/night) you can go somewhere that can get the basics right and make you feel like they actually want you to stay with them. Cancelled my original reservation at least 2 weeks before intended stay. Was notified after the original check-in date that I never showed up. They charged me a one night no-show fee. My travel agent and I called them several times with the cancellation confirmation number. The desk clerks and the manager were rude and uncooperative. Refused to refund the fee DESPITE being provided with the cancellation confirmation number: "Your reservation was never cancelled." We will make sure that our company never uses this hotel. This hotel is very inviting and peaceful. The pools are very nice and it was pleasantly quiet. The room was very nice and we loved our stay! We had a little trouble with the wifi, but it was workable. The breakfast is not included, but it wasn't overpriced and tasty. Overall, this is a great place to stay - and we really enjoyed Russian River Brewing Company in downtown Santa Rosa. Visiting Sonoma State. We needed a place to stay for one night and we had a very pleasant experience here. Easy to find, quiet and clean with comfortable beds. Pool and jacuzzi were great and easy getting in and out for our quick visit. The best part of this Inn is the Garden. It's a little pricey, but clean and everything is in tip-top shape. Overall, its a good place to stay in Santa Rosa, close to downtown and freeway access, which is good. Quiet location and good staff service. The place was easy to find. I did not had a reservation but it was available. I called for some complementary items and I worked up. The reward points however cannot be use in the first visit. While the room was clean, the bed was beyond hard! As an older female traveling alone having to cart computer bags and luggage up and down stairs was difficult. I have white hair and the clerk who checked me in knew I was traveling alone and still put me in an upstairs room! Even with a noise maker (which I travel with) I could hear people talking in the rooms which connected to mine while I was trying to sleep. I would not stay again nor would I recommend this hotel. Thank you for informing us about your stay. I can understand your frustration, I to have white hair. I do wish you would have let us know when you made this reservation that you needed down stairs. We assign rooms the night before arrival. And they was no note that stated you wanted downstairs. Upon your arrival there were no other Deluxe king beds available downstairs, or we could have moved you. Sorry to hear that you will not be staying again, nor recommend us to your friends, However we do hope to see you again. Again we arr sorry that we did not meet your expectations. This hotel got the job done. The room was updated, clean and mine was quite large. It opened onto a nice garden area with a pool and hot tub. Property has 2 pools. It is on a busy street with not much around it to walk to. That said, it's an easy drive to anywhere you may need to go. It was a little hard to find. Drove past it twice. Small, BLUE BW sign. Actually looks more like an apartment complex than a hotel. Bathrooms were a little small for two people trying to get ready at the same time. No breakfast and when we went to restaurant they were out of vegetables. How's that happen? "Very nice staff was the best part"
All of the staff was extremely helpful and friendly. One day they did not have lettuce or tomato at the restaurant so we had to go off site to eat, which was a bummer. There was floss on the floor upon check in. The washing machine did not clean the clothes and caked the detergent on them. I am a senior woman traveling alone and felt respected and safe. The hotel is quiet, clean and the on site restaurant for breakfast and dinner is wonderful! Every member of the staff I encountered were professional and accommodating. I am planning another stay there in the next week. "Nice hotel, clean, comfortable, affordable"
My wife and I stayed at his hotel while visiting friends in Santa Rosa. We actually ended up staying in two different rooms on subsequent nights due to my booking error. The hotel was sold out both nights, due (I think) to a large music festival being held the weekend we were there. Both rooms were large, clean, and appeared to have been recently renovated. The king sized bed was very comfortable. The bathrooms were smaller, but adequate. Front desk personnel were friendly and helpful. The hotel has two outdoor pools and a hot tub. The pool we swam in (after a long very hot day touring wine country, was very clean. We did not eat at the restaurant on the property. Good value considering some of the prices of other hotels, and we would stay here again. Enjoyed the stay here, room was very clean and liked the patio outside. Easy parking next to room. Comfortable beds, good reception on the TVs. Front desk service could have been better but we didn't need them much. This hotel is very out-dated and tired. Furniture had stains although rest of room was clean. Large gap around door which necessitated putting a towel on the floor to prevent the light from coming in. Staff was pleasant and caring but the room did not meet our expectations of a BW Garden Inn. Would not stay here again. Upon reading reviews we decided to stay, WOW we were very impressed with the amazing renovation, the staff were friendly, the room amazingly clean, the grounds very beautiful. We ate at the café dinner and breakfast. Food and presentation great. We will defiantly stay here again when in the area. Thank you for your wonderful statement. Pleased to hear that you ate in our cafe and found the presentation of the food met your needs. I am also pleased that you approve of our renovation. Just so you know in the fall we will be renovating the rooms in the garden area. Please do not hesitate to let us know how we can make your next stay more enjoyable. The room we had was on the first floor in the corner(#159). It was perfect for us!! It was very quiet, the room was spacious, clean and the beds where comfortable. For the price, I was surprised that the place did not provide continental breakfast. Just coffee and a grad n go bag. However, they were able to accommodate us with a late checkout which helped us tremendously before having to get on our 8hr drive. I would definitely consider staying again next year. Thank you for taking the time to respond. I am pleased that you the room you had was perfect. I do hope you had breakfast in our cafe, It is very reasonable, and good home cooking. We do hope to see you next year. If there is any thing that we can do to make your next stay more comfortable, do not hesitate to let us know. I particularly enjoy the gardens. Rooms are very clean & spacious. It's getting a little expensive in summer, but I still stay there because of the location and the well kept garden plantings everywhere. The room was quite overpriced for the quality and location considering the price of other Best Westerns in awesome places like Newport, OR. The staff was rude and not helpful with applying my rewards number. I'm not sure what I get from a rewards account especially considering that I have to pay higher room rates than I would if I just booked on Priceline. Nice option if you're on a budget and looking for a place to stay in the pricey Sonoma wine country. Yeah, it's your basic 1960s-era motel, but the rooms are clean and quiet, the locks felt secure, all that good stuff. Comes with the usual mini-fridge and microwave. We especially liked the heated pool and hot tub! One major downside, though: no free breakfast, although there is a small on-site coffee shop. Older motel, but upgraded. Very nice, clean room. We had a back patio with chairs looking toward the courtyard. Very comfortable stay! Firm, comfortable bed. Very friendly, helpful staff. Highly recommended!! This is a very low key hotel that takes dogs and has nice landscaping to make it easy to walk them. The rooms are clean, nicely decorated and the complex was quiet and centrally located. This isn't fancy but a good value and I will definitely stay there again since I travel from Seattle to Los Angeles every year. The room was good, but the pillows were to soft for my taste. It wasn't the easiest to find and it was to cool to use the pool. Didn't like the fact that they had work being done in the parking lot and didn't even feel the need to mention it at check in, So I wasn't to happy being woke up by the noise the next morning. Thank you for being a return guest. I am pleased that you approve of the makeover. In the fall we will complete the garden area. We do look forward to your next stay. What a dump. Our room was outdated, but adequate, the bathroom tiny. Shower had no handrails. Antique wall air conditioner and loud. Housekeeping did not clean our room. Why? Generally BW has comp breakfast, but not this one. Only benefit is being close to 101 Hwy. Dear LBJoyride, I want to apologize for your less than satisfactory stay. We are currently on the process of a complete renovation of all our rooms. I will look into the reason that you did not receive any housekeeping service, I hope you called the front desk and they were able to restock your room with towels and toiletries. Thank you for your comments, we use them to try an provide a superior experience for all our guests. "Our 2-day stay in Santa Rosa Ave., to attend wedding"
Smallish room, single-Queen as requested. Luckily all the single Queen.rooms form around the 2nd pool, towards the rear of the property. Away from main road's traffic noise - surprisingly quiet. Lovely grounds. Sweet little cafe for breakfast or dinner. Plants / lawn beautifully kept by a careful gardener. Lovely roses. Nice that check-out is noon or a little later. Odd that both framed prints in the room were IDENTICAL ! So. uncaring. Toilet too low - for midgets ? - for me (long legs). Other than the toilet being awkward to get down to, all was lovely - especially the pools ! "Thin walls, poor quality bed linen"
My husband and I were pleasantly surprised to find this older hotel quite well maintained. The grounds are beautiful, the pool very clean and the room good sized. We were surprised that breakfast was not included although their website honestly never said it was. There is a nice little restaurant in the centre of the property that appears to be specifically for hotel guests. We had breakfast there and the prices were extremely reasonable and the quality of the meal was well above average. We will definitely ask for the "garden" section next visit as the units in this area appear to be newer and have a private patio. Thank you Rev3lations. So pleased to hear that you prefer Best Westerns. I also thank you for mentioning the great rate, and how quite it was for you. Please come see us again. Maybe next time you will not have to work, and can enjoy some of the thing s that Sonoma County has to offer. Comfortable rooms and bed, very quiet. Nicer than Healdsburg property and much quieter room as well as Dog friendly with more reasonable fee. No free breakfast but cafe on site as well as coffee in the lobby. Two pools and spa. Very nice employees. This place was a great value! Very quiet and clean rooms with a fridge and microwave. I ended up having to be in Santa Rosa an extra night and didn't want to spend $155 again. This was about $40 less & very comfy. Thank you for taking the time to respond. I also than you for commenting on the clean rooms, as well as the fridge, and microwave. I am glad that we save you about $40.00 a night. We look forward to your next stay. "Best Western, Santa Rosa, CA"
All, but the 6 nites we stayed at Best Western, were out of the USA or a timeshare. We like Best Western for it's convenience, cost, location, and cleanliness. We've never had a bad stay and we always try to stay at a Best Western hotel. Thank you for being a loyal Best Western member. I am pleased that you found our property to be clean , and the location was good. Where ever you travel I do hope you continue to stay at Best Westerns. Just stopped here for a couple of days to attend a conference nearby. It is a pleasant hotel, clean and pretty nice gardens views. I have been in this area before and this is probably one of the best options around! Thank you Laurie. We do apriciate you taking the time to give us your thoughts on your stay. We do hope to see you nbext time you are in town, since you think we are the best option around. Feel free to call us if you have any questions. This is a very pleasant hotel with nice gardens. They are making upgrades to the grounds and the rooms. I had a shrimp salad from the restaurant on-site and was pleasantly surprised by the quality and quantity. I would recommend this hotel. Thank you for your response, I am pleased to know that you took notice of our improvements that we are doing. I do hope to see again, so you can see the final touches we are doing. Just so you know, we are also putting in all new furniture also. Do not hesitate to call next time you in in Santa Rosa. Our stay at Best Western Garden Inn was only one night but is was very quiet and the room was recently remodeled; new carpet, paint, tile,counters, etc. The TV was large with good channel selection and easy internet connection. The grounds were clean and well kept. We stayed in a pet friendly room but there was no dedicated pet area. thank you for your recent comment. Just to let you know we have remodeled the rooms, but we still; waiting for all the new furniture. So be sure to check back and see the final finish. "Wasn't the best western I thought"
Well good morning again S.C This is the 3rd time you have responded. As I stated before we are sorry that you did no.t enjoy your stay. And again you could have called the desk. we would have brought you another do not disturb sign. The toilet is a standard size, and there is no hole in the shower ceiling. The toilet and shower area are not that big, but you also have a large vanity area. "Great place to stay on your way through northern California." Cute and quaint little Best Western located right in downtown Santa Rosa - literally walking distance to Russian River Brewery which made for a perfect pair. There is a heated pool and Jacuzzi on site at the hotel, no continental breakfast but there is a nice restaurant located on site which is decently priced and has good food! We stayed overnight on our way to Eureka to visit family. The grounds of the hotel were very nice. The parking was limited due to spots being taken up by construction containers. They have a beautiful garden area. Thank you 885jeannetteb for staying with us on your way to Eureka. The construction containers are actually the new carpet and furniture for our rooms. 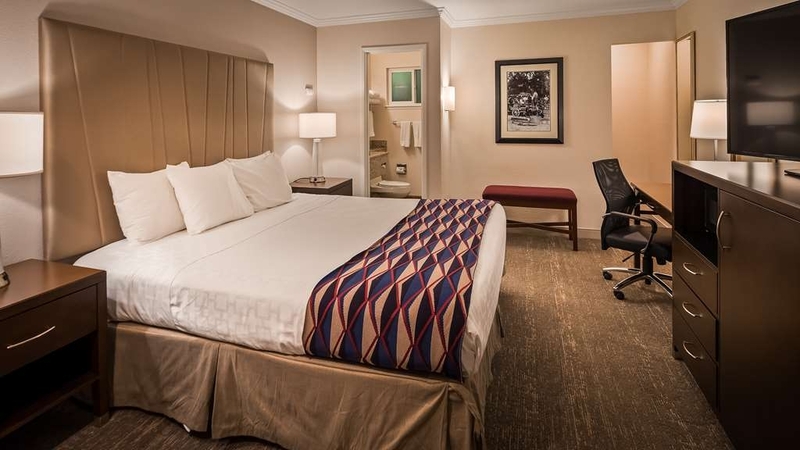 We are in the process of replacing , and updating our rooms, so be sure to stop by again next time you are through Santa Rosa. An excellent dog friendly place to stay. Staff works hard to help you. Recently upgraded and renovated. Reasonable price. We are repeat customers and recommend it to our friends. On a recent stay we had a medical emergency and the staff went out of their way to help. We got the very first room in the single story part of the hotel. It was quiet, even though it was the closest to the street. It was clean. It had fluffy towels. But it was really tiny. And with a really tiny bathroom. I can't say we needed much more space, but if I wanted a room like that I would have gone to a motel next door for less money. I feel bad saying this because everyone working there was really nice - front desk, the little café (that made Mickey Mouse pancakes!). And the pool - the one that was heated - was fine. But we were there for 4 nights and every night we would walk into our room and I almost felt claustrophobic. Thank you for letting me know about your stay. I see you booked a standard king bed unit. 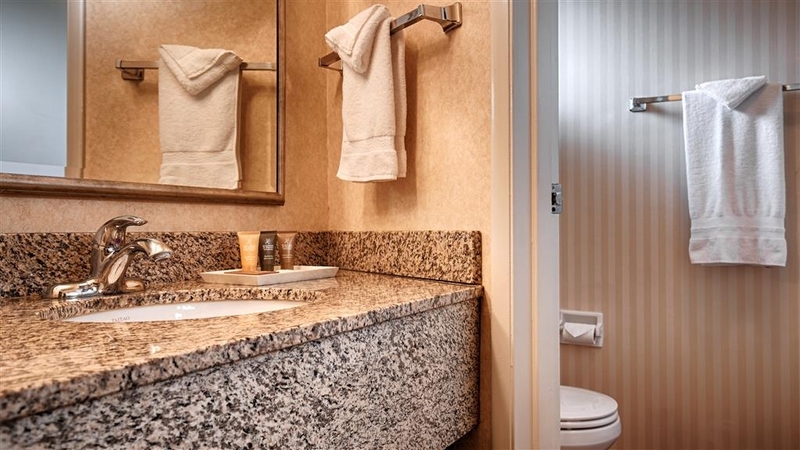 Next time you come back to us, book a Deluxe king, Bigger bathroom and vanity area. All around bigger room. The room that you were in are something that a business traveler books, We do hope to see you again. 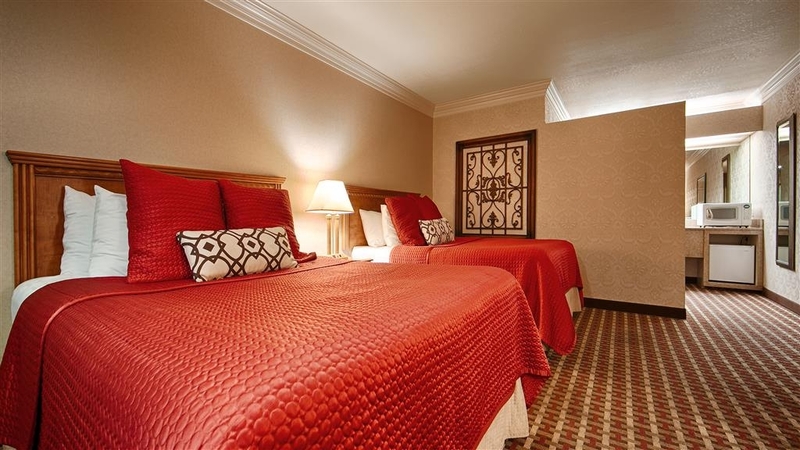 "Love this particular Best Western"
Great rooms, fantastic cleanliness, and amazing beds. You can't beat the prices in winter - in Summer, the rates are very high for the property. It's perfect for us with our dog. Ask for a remodeled room and you'll be pleasantly surprised. We've been coming here for over five years and have never been disappointed. Thank you for being a return guest. Just to let you know in the beginning of next year all the rooms are going to be remolded. "Nicely landscaped, generous sized room"
A trip to Africa....without any airplane rides! We were taking our granddaughter to Safari West as a birthday gift and stayed at the Garden Inn the night before our "safari". Convenient, nicely appointed with beautiful grounds! Easy on & off US 101. Would definitely stay here again....even though we didn't travel with pets on this trip, the "pet friendly" policy would bring us back. Thank you so much for your comments. Sounds like your trip to Safari West went well. I am pleased that you also approved of out property. We look forward to seeing you in the future. Pretty much no frills, but clean and quiet and a good place to rest.Convenient to just about everything in Santa Rosa and Sonoma area. These rooms are external, so you drive up to your room. The rooms are much nicer than you'd expect from the outside. They did have a pool and hot tub, but we did not use them. Thank you Nick, I am pleased that you stayed with us, and hope that we see you again. We will start at the end of the year on the inside of our rooms. So next year I do hope you call for reservations when in the area. I f there is anything we can do to make your nest stay more enjoyable, give us a call. Stayed at this hotel and was very pleased with the room. Not a new hotel but very clean and comfortable. Stopped during our trip up the Coastal Hwy 1. No reservations but they had rooms. Lobby was decorated with Halloween stuff for the seasonal mood. Staff were very nice. They had a pool but with the rain we didn't use it. I would definitely stay here again. A little pricey but it was nice and quiet. Thank you Bobgpaa. I am pleased to here you chose our hotel to stay while on your way to the coast. I do hope you used our hot tub, it is covered. so you are not in the rain. We do hope that when you come through again,that you will stay with us. "Garden Suites are Very Nice"
Our first two nights were in a standard room which was OK but small. Our last night booked with rewards points was in a "garden suite". Very nice, large and the garden area was relaxing to enjoy some wine which we had purchased on a wine tour that day! Office staff was very friendly and accomodating. Thank you Sailingjon for staying with us for three nights, And I am pleased that you are a Best Western Rewards member, and were able to use your points for a free night stay. Do not hesitate to call next time you are in the area for reservations. "Excellent room; disappointing breakfast at their restaurant"
We were pleasantly surprised at how large and accommodating our room was--lots of room for one to wake early & the other to sleep later. We requested hearing assistive devices and the under-the-pilow vibrating alarm clock and the doorbell that flashed the lamp were already in place. There is no free breakfast and the restaurant on-site had very slow service and the food was not hot.Stay here, but eat elsewhere. I do thank you for taking the time to respond, I am pleased to hear that there was plenty of room for you to wake up early, and let the other sleep. So sorry you had a bad experience in the cafe. I do hope to see you next time you come to town, call me and I will make sure you get a free breakfast. "Spacious Rooms and Decent Rates"
I have been to many BWs and the size of this regular room was enormous. The beds were superb and there was a small table and desk. There is no complimentary breakfast and the onsite restaurant was adequate and fairly cheap. I like to stay in this motel when I am in town. They are very nice and I always get a great room. They have done a lot of work in the garden area by putting in a fountain, benches, hot tub and another pool. They have done some remodeling of the rooms. The room is clean, TV and fridge on the larger size, there is a microwave too. The bed is comfy. I was disappointed that the WIFI was poor and the TV signal kept going out. I was told they were changing over to a new provider. I had a queen, nonsmoking room and noticed there were no plug receptacles by the bed. With more and more people working while sitting on the bed instead of at the desk and with more people using things like sleep apnea machines, there needs to be a power strip beside the beds. Still, It is a great place to stay. The lighting in the vanity area is wonderful. I usually stay in the king bed room but this time I was in a queen room which was just a little smaller. Thank you Katie. I am sorry that you had problems with the internet the day you were here, It should have only been a few minutes for the change over with the new system. Little did I know they ran in to a few problems. But now all is good, and we do hope to see you in the near future, also just so you know, starting at the end of the year, we will be upgrading all the rooms on the inside. "Pleasant Surprise in Santa Rosa"
Nice find! The garden setting of the Best Western was comfortable and peaceful. We enjoyed the swimming pool, spa and simple breakfast. Great service, clean and comfortable rooms, quiet at night. NO ROAD NOISE. Unfortunately, the WIFI was not working! This must be repaired before my next visit! Thank you Peter, I am happy that we were a pleasant surprise. Glad you enjoyed the pool and spa, and the breakfast. I am sorry that you had problem with the internet. This was the day we were in progress changing over to a new company. All up and running with the new service. I do hope to see you soon. We needed a room for one night at the last minute; the online price listed was $130 a night. After calling a couple other hotels which had no vacancies, we called this hotel and booked the room. My boyfriend was paying and did not realize that the price he was charged, $235, was $135 more than I had seen in the online listing. While the room was nice and clean, it was just your average motel room, and certainly not worth $235/night. This is not The Ritz. But it is everything it's advertised to be. It is clean, the staff is courteous, and the rooms are spacious. It is a 1960s or 1970s "motor hotel" but is an adequate sleeping facility. On site "coffee shop" offers a perfectly fine breakfast at a reasonable fee, and brings back memories of those 1960s motels. Thank you Numbers & peeps. Pleased to hear that our property met your needs. I do hope that next time you are in the area that you will being staying with us. We will be updating our rooms at the end of this year. If you have any questions, feel free to call us any time. "Very Nice but Old Style Motel"
The motel is very clean and has all the basic amenities. It's the old style where the doors open onto the parking lot which is not to our liking for security reasons. The location is less than desirable as neighboring properties are pretty run down. On the plus side, the motel is very well maintained and we heard very little noise after dark. It's actually quite a large property with more units in the back than I first realized. I felt it was a bit pricey for a stay that doesn't include breakfast but it's the immediate neighborhood that bothered us the most. My son lives in Santa Rosa and he just had a heart attack . I came to visit him. Hotel and rooms seem to be recently renovated . Rooms were good and beds comfortable. Internet was best I have experienced . Thank you Ram S. I do hope that your son is OK. i also thank yo0u for taking the time to respond about your stay at our property. Good Value for a quick stay. The bungalow was clean and quiet. Would love to have a free continental breakfast. The staff was response and it was nice have a small cafe on the grounds. Ice was always available and appreciated the pool. A small workout room would have made it even better. 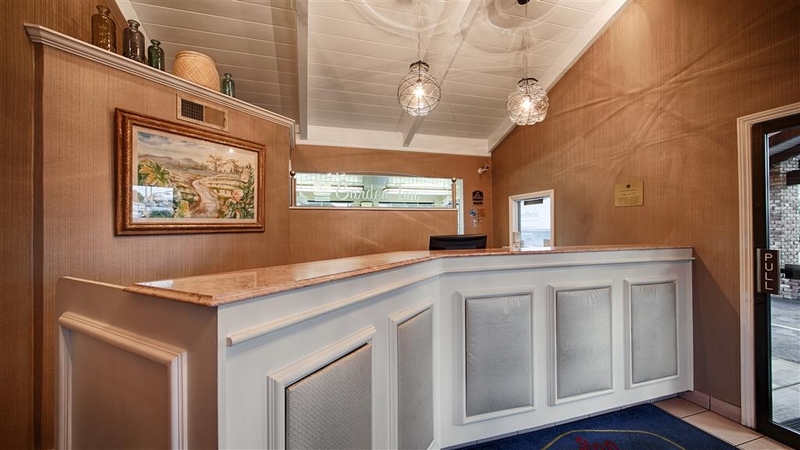 "Best Western Garden Inn stay in Santa Rosa Ca"
This motel is an older building but always clean with very welcoming staff and the restaurant on site has an amazing inexpensive selection for breakfast with staff that always has a smile on their faces! For the money this is the best for your buck!! It is also quiet located far enough from the freeway and set up very well with a variety of rooms. Thank you Wendy for being a loyal guest. If there is any thing we can do to make your next more enjoyable, please let us know. And I am pleased that you eat in our cafe, How do you like the cafe's new look? Thank you for your response, pleased to hear your room was spacey, and your check in was fast and friendly. We look forward to seeing you when you are traveling our way next time. "Decent hotel, fair price, it does the job for an overnite." Hey -- it's a Best Western in Santa Rosa, not The Ritz in London. So don't expect too much for $105 and you won't be disappointed. I was in Santa Rosa for a night on business and needed a place to stay. 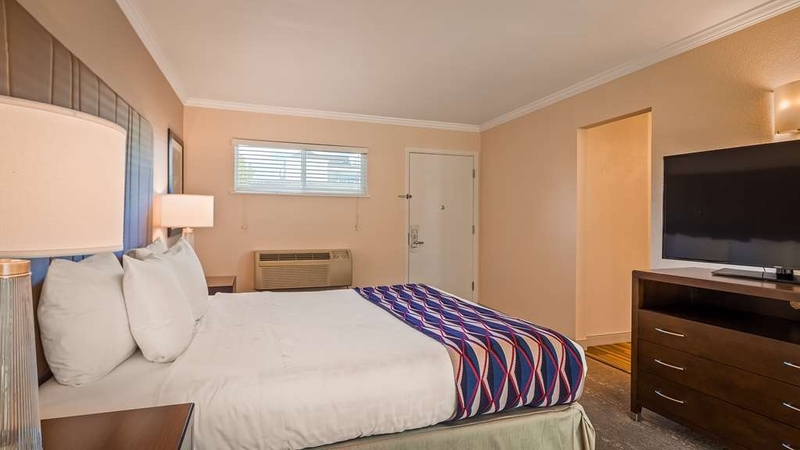 It's convenient to the 101 freeway and the room was large and clean with large comfortable beds. The decor feels slightly 1980s, but instead of feeling bad about that I call it "retro." This is a fine place to stay overnight but you wouldn't want to spend a week here. Thank you Walt Morton. Glad we were a good location for your business trip. However the end of the year we will be changing the decor in our rooms. I want you to feel like when you return it is not just a good place for one night, but several nights. Please do not hesitate to call next time you are in town. looking at all the Hotel prices in the area of Santa Rosa, I thought the price of this Hotel would meet our expectations of a 3star AAA rating of a Hotel...not! it was a smelly motel, the lamps and clock were plugged into a crusty extension cord so all of them didn't work together, The bathroom was in desperate need of remodeling, we didn't even shower in the morning, we wanted to leave ASAP. The bed was in need of a new mattress also, it was not a Comfortable room at all. First I am sorry that we did not meet your expectations, I see you booked a standard king room. These are a lot smaller rooms than the Deluxe king. I think you would have been much more pleased with the bigger room. I however disagree that our property is a smelly motel. Sorry we will not be seeing you again. If however you do return do not hesitate to call and we will try to make your next stay more enjoyable. Rooms were nice sized and clean. Was overcome by a strange odor outside when we arrived but it went away. Think they were spraying for something but were not told that when we arrived. Staff was helpful in suggesting winery's to see in the area. Hotel is away from downtown and city is hard to navigate in. Bring a GPS. Nothing really close that you can walk to. Thank you jw44442016 I am pleased you found our rooms to be nice size and clean. i am sorry you felt that downtown area was not close by. We are actually only 1 mile from the heart of downtown. We do hope to see you in the near future. When you do return, let us know if we can assist you in direction on any certain area, we would live to help. "Best Western Santa Rosa, Ca"
Overall experience very good. Room was clean and the check in was smooth. Cleaning service was very good. Restaurant food was good and offered a variety of options for Breakfast. However, once food was served, server never returned to the table except to bring the check. Pool areas were clean and there was plenty of areas to sit and relax. Thank you Steven, I am pleased that your overall experience was very good. I do hope to see you in the near future. I am so sorry that the server did not return to see if you needed anything. I do hope that this does not keep you from returning, and eating in our cafe. "I would have liked to be able to take a shower"
Not a bad room if you ignore the noisy air conditioner but what ticked us off was that we went to turn on the water in the shower and found that the faucet was sort of hanging there and no amount of turning it would start the water. As we checked out I mentioned the problem to the desk clerk and was told that "you just need to pull on it really hard to the point where you think you might break it". Thanks a lot for letting me know! Thank you Me AND THE Little Woman, I am sorry that you could not get the shower to turn on. You do not have to pull really have to pull the handle to the point of breaking it. I do wish that we could have sent someone over to show you how turn the shower on. It is really not that difficult. Again please accept my apology. "surprised to fid this jem in the middle of Santa Rosa"
We needed a place to stay because we were going to a concert in the area. We normally stay at the double tree in Rohnert Park. It was a Labor Day week end so they needed a 2 night minimum and almost doubled their prices. We found this jewel for almost half price. The grounds are lovely, the have a cold and heated pool as well as a hot tub. We had a room near the pool area and it was all single level, a parking place out your front door and a patio out the sliding glass doors from the room. There was a fountain ,great established trees and pretty grounds. They have a restaurant on site that serves breakfast and dinner, Both were good and reasonably priced, with excellent service.The room was on the smaller side but was quite ample. They still had 2 chairs and a table, we had a queen bed that was quite comfortable. Nice size TV. Plenty of things to do in the area as well as a great starting point for wine tasting. Thank you, and I am so pleased that you chose our hotel, So next time you come to Santa Rosa we do hope that you chose us again over the Double Tree. We have a lot more updates coming to our property the end of this year. There was a few concerts going on in the area, not sure which one you attended, but I do hope you enjoyed it. "Great place for a night "
Thank you for taking the time to tell us about your stay. I hope you did well in the marathon. I am Pleased to hear you enjoyed the spa after the marathon. And We do hope to see you again next year. Older hotel, well maintained; ground nice; two pools Room was not made up until 4pm, despite complaints. Response was unfriendly. Poor cleaning service. Rooms were large and remolded. Inexpensive on site dining. Outskirts of town. Thank you for letting us know about your recent stay at our property. I am sorry about the lack of communication between the desk and housekeeping. I do hope that you will give us another chance, to show you we are actually very friendly. Again please accept my apology. "Very quaint with nice staff"
Thank you for letting us know about your stay. Pleased to hear the location and the noise was not a problem. I will make sure the pet area gets some deodorant. Please if there is anything we can do to make your next stay more enjoyable, just let us know. I always stay at Best Western because each hotel is consistently clean and roomy. This stay was a little pricey but we stayed at a different chain the following night and I missed the cleanliness and amenities of Best Western. You can always expect Best Western to be the best value. Thank you Kathy. Pleased to hear that Best Western hotels are your choice for cleanliness. The rates in the summer are higher, due to the area, and the demand for rooms. We do hope to see you next time your are in the area. This property has a potential to be a good stay. The year long renovation need to be completed to make the stay enjoyable. The lack of finish tends to make a guest feel as though they are at their own home remodel. The billing process needs to be improved and be accurate. Thank you Rolin, I am sorry that the remodel is taking longer than we thought it would. We are nearing the end. We actually started the first of the year, We did have a lot of permits from the city that held thing s up, not to mention the wet winter we had. But Please come back and see the finishing touch. Great location off of Highway 101 and a few minutes from downtown Santa Rosa. The garden setting is great therapy for weary road warriors and tired travelers of all ages. The renovated pool, covered spa, and bubbling fountain provide a perfect end to a long day. No breakfast service, # of towels got smaller each day. Coffee cups & water cups missing most days. Rooms were dark because we had to keep the blinds closed due to the construction rigt outside our room. Pool not heated. This hotel is motel style, however, some of the rooms are garden in and there is no one below or above you. These rooms are very nice and updated. You also have a patio in the garden facing a pool and hot tub. The hot tub was not working when we were there, but the pool was just fine. There are two pools available to use. Keep in mind, this hotel does not have free breakfast. There is a restaurant on site, but it is not the typical best western free breakfast. There isn't a ton around regarding shops or food and the hotel is off a main road. But, you cannot hear the road. The area is slightly sketchy, but short stays are just fine here. This is not an actual Best Western hotel. At least not your typical Best Western. My guess was that it used to be a motel before and they bought it and fixed it up. the rooms are spacious and comfortable and clean. But the best part was the swimming pool. My little niece had a really great time swimming. it was clean and well kept. They have a little restaurant on the property that looks like a continental breakfast but it's actually not. pretty good food just slow service since it's a two man operation. Overall a pretty suitable stay in Santa Rosa! Thank you for taking the time to respond. I am glad that you and your niece enjoyed the pool. Our cafe is usually 3 three people, looks like the dishwasher was not available the day you had breakfast. Again thank you, we look forward to your next stay. 2 problems at this hotel, bed bugs being the worse! My hubby and I woke up in the morning to find bites on our arms, legs and hands. Looked up bed bugs and had the pattern it said to look for. We were absolutely disgusted! Never have I ever experienced this. This was the first hotel we stayed at on our travels so it had to be from this hotel! When speaking with management, her response was, "We've never had that problem." She was more concerned with the leaky pipe in our room (which I had to put a trash can under it since we noticed late at night). She rushed to tell maintenance and never returned. She had the maintenance guy tell us we were being moved because of the broken pipe. Not because of the BED BUGS. Not once did anyone apologize or say they'd take care of it. Thankfully we were moved to a new room but I still didn't sleep fearing I was being bitten all night. I don't think management took us seriously so that hotel will be infested soon! Do yourself a favor and stay somewhere else! We moved to the Doubletree which was same price but way nicer!! I do thank you for letting us know of your problem, however we take all comments from guest very serious. We did address the issue about the leaking pipe, there was no mention of bites. I am the general manager, and I am not aware of this problem. We have had Ecolab inspect our rooms, and they have told us there is no sign of any bed bugs. We stay here while touring the Santa Rosa area. It was perfect for my granddaughter and I. Heated pool when we were not out touring. A restaurant on the premises for breakfast and dinner which we visited. Food was great! Staff was very pleasant and friendly. thank you for letting us know about your stay. I am pleased that you visited our restaurant while you were here, and that you thought the food was great. Not sure what day you checked out, but our spa is now open. I do hope you will come stay with us again. We stayed one night on our way to the Redwoods. They're doing renovations. They will have beautiful gardens outside each room. I thought it's going to be lovely. My husband and grandson had a hard time with the renovations going on. Each room has a private patio looking at the gardens. The room was clean and comfortable. I'd like to go back when it's all done. I would recommend this hotel. Thank you Pam for viewing your thoughts with us. I do hope that you stay again, we are almost finished with the renovations for now. and our spa is open. We are going to get nice little bistro tables and chairs for the private patio are. Sorry your husband and grandson had a hard time with the renovation. This hotel reminded us of a 1960's motel. We parked outside our room. Looks like they have finished remodeling and we were very comfortable. The room was very nice and clean, the bed was comfortable with lots of pillows and it was quiet. Plenty of charging outlets, free wifi, updated tv, and cold refrigerator for drinks. Desk staff was very nice and friendly. "Poor management - Struggling to hang on"
We needed a place to stay after a late night turned into a very early morning on a road trip to Northern CA. We booked through Best Western online and when we arrived at 2AM, the desk manager (Danny) said he didn't have any record of our reservation and couldn't do anything until our reservation came up in his computer system. It took us, not the desk manager calling Best Western (corporate) to even start the process of checking in. The desk manager then proceeded to berate us for booking online and not calling the him at the hotel directly. After we called Best Western corporate it then took the desk manager over 30min to check us in. Had it no been 2AM we would have left in a second and found other accommodations. The rooms were ok, freshly painted but overall dated. Between the poor service and dated rooms (especially the bathroom) we were surprised to see the Best Western name on the hotel. We won't be back. I entered my room on a Thursday afternoon. I had two queen beds. When I went to turn down the bed I'd chosen for sleeping, I found a long, black hair in the bed. I have blonde hair. Grossed out, I inspected the other bed, which did not have hair but the sheets were wrinkled - I honestly could not tell if they were wrinkled from poor folding or not having been changed prior to my check-in. I decided to give the hotel the benefit of the doubt. In the morning, I left both beds unmade and I went to the lobby (around 8:30 a.m.), explained the situation, noting the hair in the bed. I requested linen changes for both beds. Management agreed. I left the premises, returning around 4:30 p.m. The beds were made, the hair was in the exact same location. I returned to the lobby, frustrated now. I more vehemently requested a linen change. Again, management (new people from the morning shift) readily agreed and within a few minutes, a member of the housekeeping staff came to my door. She attempted to hand the linens to me for me to change the bed. Frustrated, I refused to accept the linens and asked her to look at the beds with me. She asked me if the hair was mine. I pointed out that I have blonde hair and we were looking at a black hair. I vigorously asserted that the linens should have been changed. She countered that I was not a new check-in. I asked her if she'd be willing to sleep in a bed with someone else's hair. She pointed out that she had not been at work on the day I'd checked in. I kicked her out of my room. I returned again to the lobby and noted that I'd kicked housekeeping out of my room secondary to her expectation that I should change the used sheets. Management offered to change the sheets herself but by then I was overly frustrated and noted I would again sleep in the other bed but would be checking out on Saturday morning (my reservation had originally been Thursday to Monday). Within a few minutes, management called my room to remind me that I'd used a third party to book and would not be receiving a refund upon early check-out. She again offered to change the sheets herself. At that point I felt the hotel had been given three opportunities to change the sheets; 1) prior to my check in (when I'm certain the health dept would like the, changed! ), 2) Friday morning when I'd first explained the situation and made the initial request, and 3) Friday afternoon when I insisted. I lost it at that point and ultimately hung up on her. Her timing and word choices were poor and they sent me from fuming to boiling over. For what it's worth, I believe management was sincere in the desire to help. However one or both of two things is going terribly wrong here - 1) poor communication between management and housekeeping, 2) poor supervision of housekeeping. Housekeeping is key in the hotel business. If rooms aren't clean, customers aren't happy. And when you have multiple opportunities to fix an error and do not use those opportunities wisely, you end up with a review like this. I did get a refund by contacting the booking company I'd used. Disgusting. I will never return to such a dirty place. "Disappointed as a BW Gold card holder"
Room was too expensive. No full or continental breakfast. Staff a bit laid back. Breakfast was offered on site, but you paid for it. Excellent Restaurants nearby, Denny's and Willie Bird's for dinner. Cost much more for breakfast than normal. Location was OK. just off the freeway (101 North). Shower was very hard to turn on and I had to call the desk. Was told to pull it really hard. Which I did and it worked OK. Somewhat the hotelstandard we expected. Some ideas and Reports: Comfortable house- but try to get a room at the ground Floor-maybe it can be a Little exhausting to get bis suitcases upstairs-if you got some. We were rather disappointed not to get a safe deposit box-all were already full (not good for us,doing a 7 weeks around the world travel with a lot of things to be saved-Vouchers,Airline tickets etc etc) Room spacious,clean,big Family(double)bed. Maybe someday we come again and recommend the house to our friends who look for something Standard. Quaint motel with two pools - one heated, one not. Room was very clean and had updated furnishing. Beds were comfortable. Room was a good size and had an at-home, cozy feel to it. Price wasn't bad either. Would definitely recommend. I enjoyed staying in the only King Smoking room on the ground floor. The windows open for fresh air and you'll need it with the spray they use to eliminate the cigarette smell in the rooms. But I liked the room and location, it's off in a quiet corner on the end of the building. We took our wedding party there and had 9 rooms. I requested them to be in the garden area and that's where they put us! It was nice all of our rooms surrounded the back pool which had recently been remodeled or updated. They've been adding new landscaping and a few other updates to the hotel. The construction was slightly annoying but it seems like they're finishing up with that soon. They have the rooms cleaned up daily which was nice. It was affordable and close to the highway. We didn't need anything super fancy and it served it's purpose. It was clean and the staff is very friendly. Only negative for our big group of 18 was there was no where to really hang out at the hotel after 10:00. But if you're heading up to that area and just need a place to lounge by a pool and plan on being out exploring a lot, I'd 100% recommend this place. We also only had 2 people to each room, no matter if it was a double queen or king, and that seemed to be a good number. Wish the hot tub had been open! Would stay again. Thank you for your input. All the rooms were booked through central reservation under 1 name, so the room type is what comes over to us. We would have been more than happy to change the room type, if we had the availability. I am glad to hear that the stay went well.. Please do not hesitate to stay with us again. Stayed at this hotel 2-3 times a week for a few months while doing work in the area. It was a decent hotel, good internet in room. The only problem we had was that one week they switched the room we ordered on the reservation and we had to spend a week in the non-smoking room because they said others booked the smoking rooms before we got there. They didn't really apologize it was like "too bad". I thought that was a very poor excuse since we were repeat customers. I expected better. Stayed here for one night on our way to Humboldt in May. Room was clean, and the air conditioning was cold, just the way we like it. There was construction going on in the morning right outside our door. Looks like it will be a nice improvement. Would stay here again. My only concern was, this reservation is under my name and I am one of your members but when I asked the front desk if I get points added for this stay they said no because I wasn't paying my company was. I opened this member ship when my company pays it all the time and that's why I use you. Hotel facilities & amenities were very nice, but Garden Cafe on site was closed for dinner; open only for breakfast the next morning. (My daughter, who made the reservations through Hotels.com, and needed to feed two small children at the on-site cafe after checking in, was unable to use the hotel restaurant for this purpose. Also, check in clerk erroneously failed / refused to allow us to switch rooms to my credit card when checking in. Thank you David for your concerns. The cafe was closed for dinner, We are remodeling the cafe during evening hours, is the time we have available. We do have it posted upon check in. There are several places to eat with in 1 mile. I do hope that you were able to find some where to take the children. I see at check out you were able to pay for your daughters rooms. I do apology for the desk clerk not understanding what you wanted to do upon check in. She thought this was prepaid. This place was clean, had a comfortable bed, and was very reasonably priced for the location near Sonoma County. The unheated pool was COLD! The heated pool was in the middle of a construction zone so didn't really feel comfortable using that. The furniture was old, the chair and ottoman stained and a little gross. I'm not a big fan of wine country, but it's a great price if that's where you're headed. Thank you Carla for responding about your stay at the Garden Inn. I do hope that when you are in the area again, you will be able to enjoy the new look in the garden area. Sorry about the stained furniture. I will make sure that it gets cleaned. I love this hotel. The staff has always been so accommodating and friendly. We stayed for a weekend, with our adult kids in another room. Every time we have stayed it has been in a room next to the pool in the back, and it has been great. This time, there are major renovations being done, but we still enjoyed our visit so much; we were there over the weekend so there were no workers. Just be sure to ask for a garden room... Can't wait to come back when it is all finished! Thank you for being a return guest. We can't wait for you to see all the changes we have made. I usually enjoy most Best Western Stays, however on this occasion they do not have the complementary continental breakfast, lots of construction going on, so it was messy and incomplete, with caution tape everywhere. I look forward to trying again once the work is complete. Thank you for taking the time to respond, Sorry about all the caution tape, We just need to make sure guest do not walk through the construction area. I do hope to see you next year foe the Country Summer event, I think you will be pleased with how every thing turned out. "LOUD CONSTRUCTION !!! UNACCOMMODATING MANAGEMENT"
FORGET IT! If you plan on sleeping, or parking, or being treated the way you want to be treated at a hotel - this is not the one. I paid over $150 for my room only to be awoke when aluminum rods were being clanged and ladders were being dragged and and erected, then loud mariachi music was being played by a maid in the room next door. Nothing else matters - I rented the room to SLEEP - and this was not allowed! They would not give me another night, they would not give me a price break, the manager had all kids of excuses. This hotel is now on my "LAST" list of places I'd ever stay again. Quiet and freeway close. I have stayed here many times and will keep coming back when in area. Good location, good wi-fi, clean rooms, quiet hotel, lots of parking, professional staff, and comfortable beds. The restaurant is very good but wish they had better hours. They were doing some construction but are very respectful of guests. I will be back. We enjoyed are stay at this hotel. The room was clean and the facilties are nice including a heated pool. While we were here there is significant construction going on in the courtyard, but the heated pool was open and enjoyable. The workers were very considerate of our using the pool too. We would stay here again. It is also in a great location for wine country while the immediate surroundings are industrial it didn't bother us. Thank you, I am pleased that you enjoyed your stay. Please do not hesitate to call for reservation next time you are in the area. We look forward to hearing from you. "Nice if a little dated"
I only stayed in this hotel one night but my impression was that it was well looked after, the staff were nice and the rooms were good. The only thing was that although the rooms seemed to have been relatively newly fitted out it seemed like they had been done in the style of a hotel from 10 years ago. It seemed like they were catering to older clientele, and I guess that's ok. One extra thing, I loved the heated out door pool, it was lovely and warm! Thank you David. The rooms are recently done, We just keep them up, however the end of this year the rooms will be renovated. Right now we are installing a spa, we just redone the back pool. As far a clientele it just depends on what event is going on in the area, as to what kind of guest book. Please come see us again when in the area. "Great place with heated pool and cheap brekkie"
Just one night here but could have stayed for more. Was a great choice in a good place.Some building work is underway but dont let that put you off, good value and a great cafe in the middle offering value choices. Rooms big, wth patio out to the pool and a good bathroom. Coffee machine was a nice addition., We wish we'd stayed here longer! On a busy commercial strip but ok for a night or two. Outside doors (not off a hallway), but the rooms were good sized and the staff was helpful.The little cafe in the back is an unassuming place for breakfast, but very good. Stayed here with my family for 1 night while visiting the Charles Schultz museum in early April. We were only planning on a one night stay and then onward to San Francisco. It was obvious that it was an older hotel and it seemed to be going through some renovation. The staff at the front desk were very nice and helpful. The big surprise was the room. I was very pleasantly surprised how spacious the room was. It was one of the biggest rooms I've ever been in at a hotel. It was nice feeling like we were NOT crammed into a sardine can. The room was on the second floor behind the office. Room 202 I think but not 100% certain. Be not mistaken, I did not expect this to be the Savoy especially from the price but I would stay there again. I must admit I do wish breakfast was included also I wish the dining room would accept credit cards. The only options for paying for your meal was to either add it to your room or pay cash. Thank you Sherwin D for taking the the time to respond. I am glad you approve of our property, even though we are an older property, you still found us to work out for your stay, from the spacious room to my pleasant staff. We can't wait for you to return, and see our updates on our property. The place was nice except that the room's back patio was crawling with construction workers. I could see that the construction will ultimately make the pool area connection to the room a nice amenity, but it seems as the room should have been vacant during construction. Thank you Kathleen for taking the time to let us know how you feel about your recent stay. Most people are aware of the construction that is going on. We have a lot of return guest that prefer to stay here instead of somewhere else. That would mean 38 rooms out of order. We would lose a lot business. I do hope you will come see our property when it is all completed. "Convenient hotel in Santa Rosa"
Plusses: Clean comfortable room, friendly checkin staff who recommended a good restaurant for dinner Do not judge the quality of the rooms themselves by the look of the exterior, which is in need of a fresh coat of paint. "Very nice Hotel ( Quiet)"
Thank you Irma. I am so pleased that you approve of our hotel. I do hope that you will stay again. I think you will be real pleased with the new look. booked through priceline and a pop up came on my computer letting me know the price had gone down for my booked dates. Tried to go through priceline to get the better price ,was told they couldn't do it even though they the advertise the best price and free cancelation . would not let me cancel to rebook at the better price and was told I would be charged $420.54 to cancel even though the booking was still almost three weeks away. When I called Best Western corp. was told they could do nothing for me to help. This no way to treat clients . the savings would have been $82.49 per night. This hotel in Santa Rosa, CA was nice and clean. We stayed one night and slept very well. The hotel staff was friendly and very welcoming. Only downside may be carryong luggage up one small flight of stairs, but for a good, clean place to stay, that was a small detail. I certainly recommend this hotel! Thank you Laura, I am so glad that you got a good night sleep, and you found our rooms clean, and my staff made you feel welcome. I do hope that next time you are in Santa Rosa, that you will stay with us again. "disappointment at the Garden Inn"
I was looking for a quick romantic getaway to Santa Rosa, close to downtown so we could enjoy ourselves. I quickly discovered that The Garden Inn was an old run down hotel. I was disappointed with the quality of rooms, the pool wasn't heated. The spa area was under construction, and that staff was not very friendly. Our shower was broken, the room smelt like stale smoke and mildew. By far the worst Best Western I have ever stayed at. Very disappointed. Thank you for taking the time to tell us about your recent stay. I am so sorry that you were disappointed with your stay. The spa is a new construction that should be opened shortly, And we do have 2 pools. One is heated, and one is not. We recently just reopened the pool in the garden area. And If I had known about the problems in your room, we would have been more than happy to move you. We are very proud of all our renovations that we are doing, I do hope that you will give us another try. "1 room out of 3 was cancelled when we arrived"
Disappointed. 1 of our 3 rooms were cancelled when we arrived. I did not cancel this room, and I was told the Best Western did. I never received a cancelation notice. Very upsetting when driving in after a long day. The hotel was really a motel. Rooms were disappointing and in need of an update. Unfortunately, we were not told that the motel was remodeling their garden and pool area. The jack hammer at 9 was our wake up call. The room was okay but very small. We would probably not stay again. We stayed in room 121- it was on the corner and was very quiet. They are doing construction, but not on the weekends. Very clean. I wish the toilet was taller- good for kids, not for tall people or seniors. Truthfully I was not impressed at first, I was scared to see what our room was Going to look like inside. Pool looks inviting, they are doing construction but I haven't heard a noise yet. Our rooms on the upper level and the only noise I've heard so far are ppls cars beep or the maid vacuuming. The room turned put clean and very spacious. Water for the shower was perfect. TV worked great and it's a nice flat screen. Bed is comfy, clean and big. The only thing I didn't like was the curtains, I couldn't get them to fully close, it felt weird being in bed with the curtains opened a bit. The front door seems to small and has enough room for bugs or hot/cold air to Come in. For the price, it's not bad! Clean, simple, great value hotel. Pool is under construction currently. Convenient location near the highway. Dierks Parkside cafe is a couple blocks away... wonderful breakfast and coffee! Check in/out staff were very pleasant. Stopped on way north, walked in without a reservation. They are pet friendly, which means they take small dogs, and charge a small fee. Room was nice and standard fare for thus chain. Pretty quiet for being right off the freeway and on a busy artery. Shops and restaurants nearby. Did not try the on site diner. Had hookups and ample parking near rooms. Would ask for at least a 50% refund, we moved a much nicer hotel for much less, cleaner more services, better location and a room that was exactly like it was shown online. The best western hotel was a complete lie, the room was nothing like what we reserved. picture of the room and it's size were totally deceptive. Sorry James we did not meet your expectations. our website shows two different decor pictures . If you do not look at all the pictures, you might assume all rooms look like the first pictures viewed. Sorry you felt the size was deceptive. Room quality is acceptable for this price range. Bed is comfortable. Clean room and bathroom. Has ironing board and iron. Wifi is generally serviceable with occasional interruptions. Sound insulation of door and window is poor as I can hear very clearly the conversations outside, not to mention the loud engine noise of cars. Better to stay in a room at the upper level. I've stayed here before - and it is as good as I remember. Spacious rooms. Clean. Friendly staff. And a room for less than $100. And access to the coast as well as Napa Valley. A bargain by wine country standards. "Physical renovation underway, online booking needs help"
I had booked a room with two queen beds online through the BW website, but was only given a room with one bed upon arrival. Haven't used the BW online booking in some time so maybe there is a disconnect with some hotels? Probably best to call and make the reservation direct with the specific hotel or at least confirm. During 4 weeks of business travel, this hotel booking was my only hiccup. The place could use some updates, and it looked like the work in progress as of February will be nice. the personnel at the front desk are friendly and helpful. 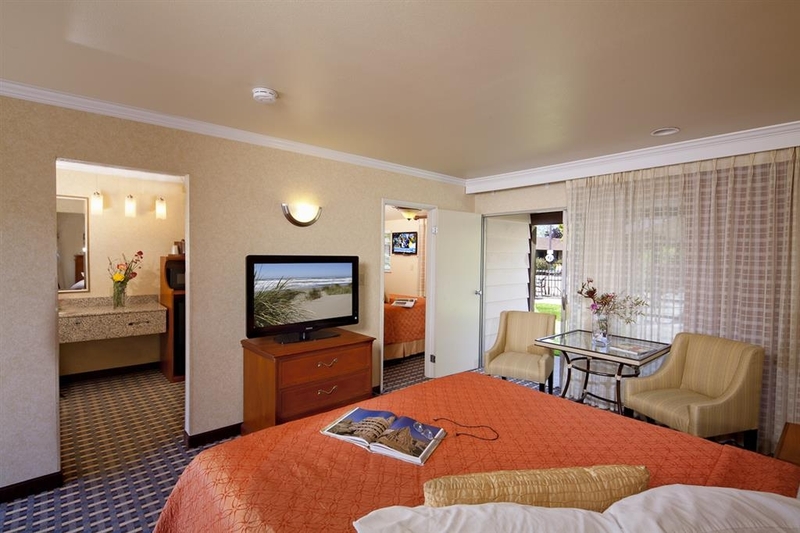 the rooms are renovated, i.e., new air conditioning unit, new granite(like) bathroom countertops and fixtures. good size flatscreen tv with HBO channel! they provided 2 luggage stands, which is pretty rare! fairly large refrigerator, which in my experience is atypical in most hotels/motels. coffee/tea maker in the room is pretty convenient to have. the king-size bed/mattress is very comfortable but firm enough for me. the bathroom window appeared to be new. the bathroom has a shower with glass door, but no bathtub. we weren't needing a bathtub, so we were fine. bathroom size is a big tight, but we're used to that as our bathroom at home is small but functional. the window facing the parking lot did not appear to be new. it was a bit noisy in the morning when motorcycles drove by. other than that, it was very quiet, and we felt safe and secure. the chair with ottoman was a bit worn but ok. there was no in-room safe, but i don't think motels usually have them. there was also a small café onsite where you could order and pickup the good. we didn't get a chance to try this. overall, reasonably priced for a mostly renovated room! good size for just the two of us and very clean! The property is very clean, the front desk people are friendly, and the on-property restaurants is not only convenient but also has good food and service. All in all, it was a very pleasant experience and we would definitely stay with them again. This is is fine old motor inn - old school with the parking lot in the middle. The rooms were big and clean and still had many of the old features - old tiles etc. The staff was friendly and helpful - it was inexpensive and a good place to stop for the night before going into San Francisco. I was not impressed with the construction or feel of the hotel. The furniture in the hotel looked worn. The property itself did not look clean or inviting. Part of this may be due to the construction. "Service was the Saving Grace"
I am a loyal Best Western customer. I really like their rewards program and have had good experiences with the company. This past stay at the Garden Inn, Santa Rosa did not upset me, but I thought the quality and value of the hotel were poor. The hotel looks outdated, which is not necessarily a negative aspect, but it is desperately asking for maintenance and aesthetic improvements. The pool and spa were currently under construction, which was an eyesore since the site was right in the center of the property and took up a lot of space, although the hot tub looked tiny and unimpressive. The room was spacious, but the bathroom was disproportionately small and claustrophobic. Our bathtub quickly clogged up while taking a shower. The television had painful delays between channel changes. The first vending machine we found ate our money and did not produce the products we paid for. The saving grace was that the service was wonderful and the staff was gracious when we reported any problems. The employee at the desk immediately refunded our money for the vending machine. The onsite cafe was also delightful. The prices were great, and the waitress was very pleasant and efficient. Extremely clean motel that is well managed and consistently provides a comfortable experience for its tenants. The entire staff is courteous, helpful, and knowledgeable....hence, that is why it is called BEST Western. Se pago el precio justo, no hubo ningun tipo de inconveniente, la persona de recepcion muy atenta. Fare price. The person in reception was very kind and welcoming. The lady in the restaurant was very sweet and gave us a great service. I was in town for the Pliny the Younger release at Russian River Brewery, and decided to stay here for 2 reasons: I liked Best Western, and it was only a mile from the brewery. This turned out to be the perfect hotel for us. The beds were super comfortable, and the rooms looked brand new. It was quiet, clean, and convenient. With only being an hour from San Fran, and Napa Valley, this was the most ideally located spot in the area. I would definitely stay again! I booked online Feb 8th for Saturday, April 9th. I got my confirmation email and put it in my travel folder. On Feb 10th I noticed a reservation in my computer calendar for Feb 9th not April 9th. After calling BW customer service they suggest I call the hotel directly because there was nothing they could do. I called and the woman on the phone didn't care at all. She said that they were booked(I didn't believe her) and could have resold the room if I called by 4 on the 9th(Tuesday). She wouldn't even meet me half way on a refund. She also stated that I typed in the wrong dates. On the BW web site dates aren't typed in, they are selected from a calendar. This was a computer error that cost me $102! very satisfied with everything at this hotel. They were doing some construction but were very quiet. The rooms were clean and quiet and plenty of parking close to each room. No free breakfast but the small restaurant had great food. Location is close to downtown. Recently stayed here to attend local event. The location is excellent..near downtown and Wells Fargo Center. The folks who work there were great..friendly and helpful. The room was spacious and clean. The wells are thin and heard the noisy neighbors..but if you are tired it won't matter. There is no free breakfast...but plenty of fabulous good in town. Overall...good place to stay. I've been to many Best Western hotels and I thought that they were held to a consistent standard of decency. This place is a dump in comparison to other Best Western hotels. It feels like Best Western bought a cheap motel, put on new wallpaper, and renamed it. This will be my first and last stay here. Great location, nice rooms, I enjoyed my stay here. Close to nearby breweries and wineries and Jack London state park. Right off a main road too so easy access, would definitely come back or recommend! My friend had some any issues in her room but that was her experience not mine. "My less then expected stay"
The recpection I received is not a Best Western recepetion. I was waiting longer then I was necesary to check in. I was treated lkie I did not know anything about the process. I told them I had a dog. So when I got there we spent too much time on dog matters. I have been to this motel at least a dozen times. I hold a best western card. I did not feel this card was even worth showing.I am starting to think why am I loyal to Best Western. Friendly service. Stayed in a room near the back overlooking the pool area (under renovation). Very quiet, didn't hear traffic or next door neighbours. Comfortable bed, good size room but awkward layout with tv beside bed. Good internet. Convenient parking right outside door. I thought it was a little overpriced based on its age and not having breakfast included. Location seemed a little seedy. But overall a comfortable stay. "Trip with Daughter to Eat and Gamble !" I would highly recommend the Garden Inn. As the Head Housekeeper of a vacation house rental company, I am very critical of hotels, motels, etc. and found this establishment to be top notch. I have already suggested it to many friends and associates. "Good choice in Santa Rosa"
We typically stay at Garden Inn for a few nights over Christmas. The location is convenient for family visits and shopping. My sister travels with her dogs and needs pet friendly rooms. We really like the little on-site restaurant for breakfast and prefer to pay the modest prices for a freshly cooked meal. The rooms are large, clean and nicely appointed. We were a bit disappointed with the housekeeping on our latest 3-night stay. Obviously used towels weren't even straightened and the coffee pot wasn't cleaned. The spare blanket had paw prints (and we were not in a pet friendly room). There wasn't anything really serious. I just hope this isn't a sign of things to come, because we really like this place and will still recommend it at this point. "Easy from airport & near shopping center"
Would probably have given this hotel an "excellent" except that is is undergoing some construction so unable to judge the final result. I enjoyed the easy access off of 101 from the airport and quite a large shopping center nearby for getting travel supplies and restaurant choices. The little restaurant on the premises was cozy, but closed before I arrived for the evening. Would book here again. "Is like staying at a Motel in the 60's but renovated." Its a nice place to stay at. Very modest but clean and comfortable beds. Need a place closer to downtown and decided to try this location. Its $40.00 cheer than the Hampton Inn down the road. Its an old style property. You park outside your door. Join the Best Western Rewards to get points for your stay. Aloha! "i'm heading back best western garden inn"
had so much fun in santa rosa ,i need to come back and do what i came for ..hoping we get the great hospitality we received last time! staff was helpful . i will let you know! by the way the rooms are larger than most ..and a charming breakfast nook on premises.. easy on and off 101 . close to everything!. see you soon! This Best Western suited our needs. It had easy access to Hwy 101 and was located not far from where we wanted to go - The Russian River Brewpub. Our room was clean and comfortable, although it took almost 30 min. for the coffee maker to make coffee! It should be replaced (we were in Room 119, if mgt. is reading this). And the walls to our room were paper thin. We could clearly hear our next-door neighbor's conversation on the phone. We had a nice breakfast in the on-site cafe and although it wasn't free, like most BW's, it was very inexpensive and tasted great. Also, all the motel staff we encountered were helpful and friendly. "Great topper to wine tasting!" The hotel does not have an elevator. I had a difficult time climbing the stairs with the suitcase. The quality of the food was poor, sloppy presentation of food and the clam chowder was very salty and the clams tasted spoiled. I threw the food away. I would not recommend this Best Western in Santa Rosa, California. From now on, I will stay at the Best Western in Vallejo, California. If you have extra time to drive from Vallejo to Santa Rosa, I would definitely recommend the Best Western in Vallejo, California. We were in town for a quick getaway. The room was clean, updated and all we needed. Easy to find and we quickly got back to the winery trail. The price was right in an area filled with expensive B & Bs. Coffee in room and fridge was useful. The cafe was a little disappointing. Our breakfast took forever! Nice older motel with a garden/pool courtyard. Pool is being renovated. Rooms were recently remodeled with nice decor. Also rooms were very clean. Walls are alittle thin, can hear TV in the room next door and people talking..not enough to disturb me though. Parking is outside your door. Breakfast is not included but there is a small restaurant on the premises. Food is acceptable, but was not served hot. It was a little busy in there and looked like only one cook, so maybe that's why. All in all,a nice place for a lower cost in the Sonoma area. "Overpriced, Would Not Stay Again"
We stayed at this hotel for 2 nights while exploring the wine country. This was not my first trip, and I have stayed in value hotels in the area before, but this place was by far the worst. This place is really more of a motel, of average to mediocre cleanliness. Our bathroom was tiny, and barely had room for one, let alone two people. All of this would have been fine had the hotel been appropriately priced. However, with the hidden taxes our total bill for two nights came out to almost $500! Our stay in downtown San Francisco was a fraction of that. Definitely not a good deal. We will not be recommending this hotel. "Very good. Would stay there again." Room was good, very clean, and appeared to have been recently upgraded. We stayed in the back and it was very quiet. It was nice to be able to park right in front of our door. Everything in the room worked, but the TV lost it's signal a couple of times. Beds were good, not great, but that's more a matter of taste than an actual issue with the beds. Lots of places to eat (& shopping) nearby, but you'll need to drive to almost everything. Solid choice if you are looking for a place for a night or two. Spacious room. Very clean & cosy. Staff very pleasant & helpful. Close to main road so can be noisy at peak times. Highly recommended. Outside swimming pool available & in process of building jacuzzi. Menu limited but only about 1 mile to downtown & restaurants. Visit to Petrified Forest recommended & several vineyards within 20 minutes drive. "Great Stay in Santa Rosa!" When arriving we were pleasantly surprised to find, although a bit older, the hotel was immaculate in common areas, rooms and grounds. Staff was great. Would stay there again and likely to in the next year. The staff was great. I would have liked to have had time to check out the cafe. Neighborhood may not be the best but still felt safe. Overall I had a great experience. It was a one night stay for business. I would recommend, it's a good price for what you get, beds are pretty comfortable and I did like the pillows. There is also a back open patio area. I didn't use it but some like that sort of thing. For the size of room and shower (no tub), and considering the usual Best Western complimentary breakfast was not included, $143.99 (not including taxes) on a Friday, and $152.99 (not including taxes) on a Saturday are outrageous. I wouldn't have minded staying if the room was reasonably priced for the product. We needed a place to stay after emergency medical activity, and Best Western Garden Inn was perfect for our needs: we got a large, all equipped room close to the hospital and handy to shopping and dining. "Place was ok for the day"
Had a tough time here, bed was not comfortable, manager beating on the door next door at 1230 in the morning??? And then yelling at the drunk next door for 5 minutes about a late check out the next morning??? Why couldn't he do that in the morning when we are already awake. "Garden Inn Santa Rosa CA"
An older facility that has been beautifully maintained. Spotless clean, nice large rooms, great location. Quite reasonable compared to others in the area. Staff is friendly and efficient. There is a small cafe on the premises with excellent food and service at a very reasonable price. A very nice stay at an affordable old style motel. Not fancy but clean and comfortable. Two pools. On site laundry. Restaurant serves breakfast and dinner. Short drive to downtown. I stayed several nights on a business trip and had no complaints. I would stay there again when in town. This place has old school vibe...clean...friendly...and large rooms to stretch out for the weary business guy. I have stayed here three times and close to everything. A glass of wine on patio by the pool is great after o long day. "Old school charm with nice clean up to date rooms"
Neat old school motel. Friendly, helpful staff on the phone and upon check in. Heated pool was great after a long day of work. On site cafe, no continental breakfast. I was a little dissapointed in the lack of a continental breakfast. I stayed here for business and don't have time to sit down to eat in the morning. Overall a nice, quiet, clean hotel that I would recommend. "It's a little old fashioned, but what a charm"
This is an old-fashioned motel where you park by your door, and I wasn't expecting much when I saw it. But we were pleasantly surprised when we went in. Our room was large and spacious with lots of closet space, a larger-than-average shower, a microwave and mid-size refrigerator, and a very comfortable king bed. What I liked most was that the place was very clean, the towels and linens were like new, and everything was neat, including the outside grounds. There is a potential for noise from the pool area, but we were there on a Saturday night and didn't experience any problems.I believe the pool closes at 9 PM. Breakfast is not included, but they have a nice on-site cafe where you can get a complete breakfast. I believe the hours are 6 AM until 11:00 AM. We were quite happy with our breakfast and the price. Free wi-fi. For the price range, this is an excellent hotel. "Great stay on our way to Disneyland"
Our families first vacation to Disneyland, we decided we would like to see San Francisco along the way. We decided to grab a bite in Santa Rosa and discovered we were ready to rest before continuing our adventure. We stayed one night here on our way to Disneyland. Beds were nice and comfy. We ended up with a room steps away from the pool. The pool was nice and refreshing heated just enough to cool off. would stay here again. Staff allowed strangers to enter guest room while occupied. Stated that no record of us checking in. Later found that we had been locked out of our room raising concern that someone else had been in our room. Family felt violated and uncomfortable rest of stay. Staff acted shocked that I might be upset. We arrived close to midnight so check-in went quickly. Our room was near the back of the property. The room was huge with a very big dressing area and bathroom. It was clean, but not spotless. The decor was quite dated. I felt like I was going back to the 70s with the bright orange bedspreads. We only stayed for one night and it served its purpose. They may include breakfast, but the guy who checked us didn't say anything, so we went to a great little diner (The Happy Hen) down the road. For a short stay, this hotel is perfectly fine. This property is just between Calistoga and Healdsburg. This made it very easy to go see wineries in both areas. Room was clean, rite by the pool. Outside Ice Machine we filled up our Ice Chest with. I was not recognized as a Platinum Member upon check in. There are many hotels to choose from, so glad I picked this one. The room was spacious, cute and very clean. The woman at the desk was very friendly. And the breakfast served in the little restaurant was great! Highly recommend. Good hotel for the price. Big and clean rooms. Great location, since it's close to downtown. Front desk very friendly and wiling to help you at all times . There is a cafe for breakfast but didn't try it. Room was very spacious and clean. The price of 220 was a bit steep, but better than others in the area during harvest time. Staff was friendly and courteous. My friend accidentally chose a smoking room online. It was late, so they offered smoking spray & changed the rooms the next day.